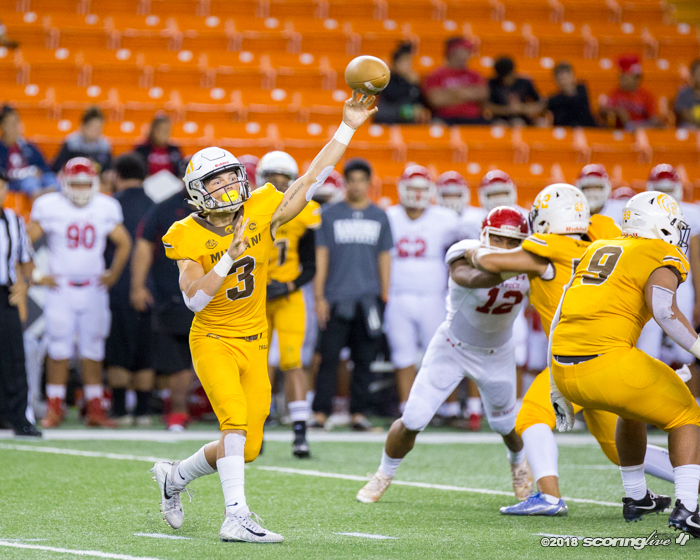 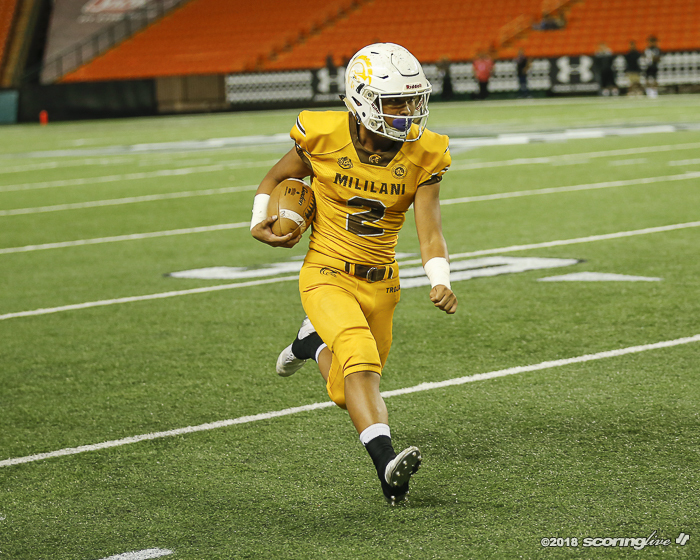 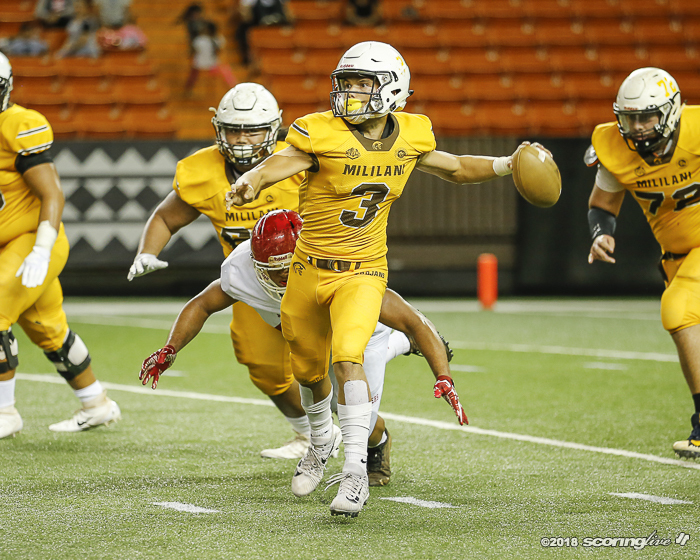 HALAWA — Dillon Gabriel threw for 374 yards and three touchdowns to help No. 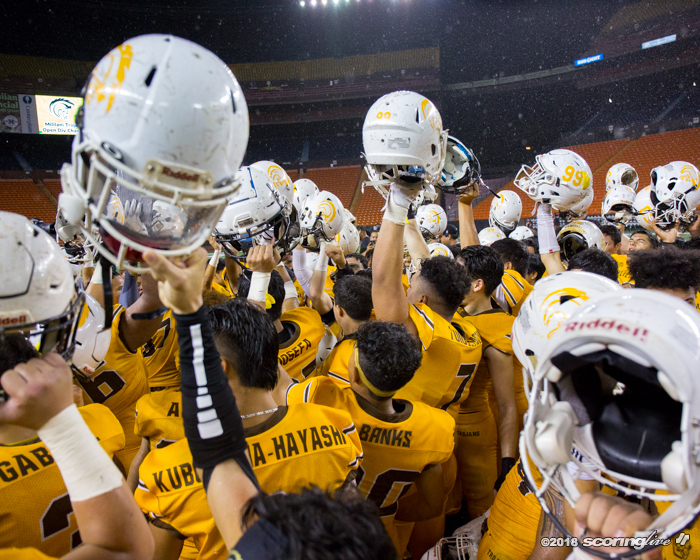 3 Mililani to a 27-7 win over No. 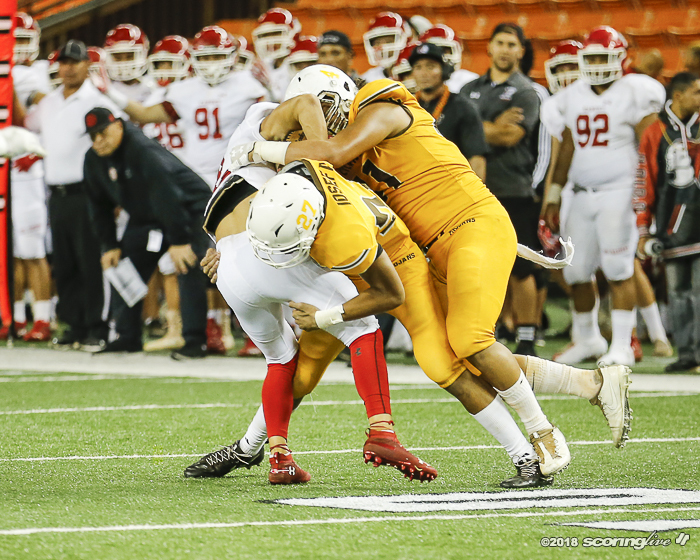 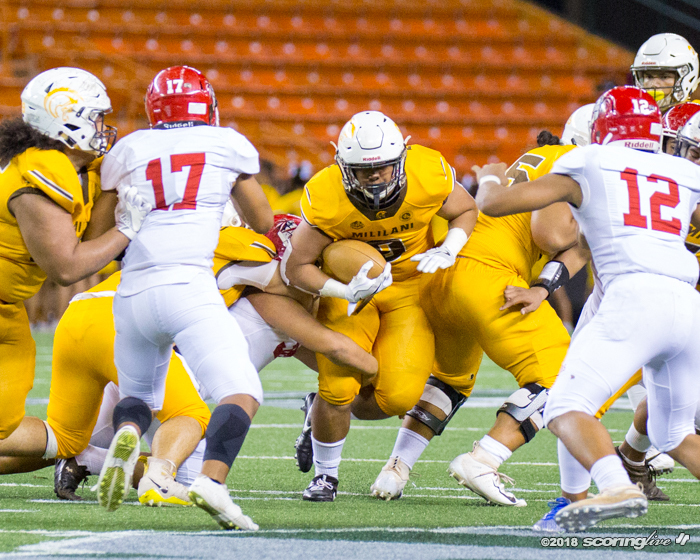 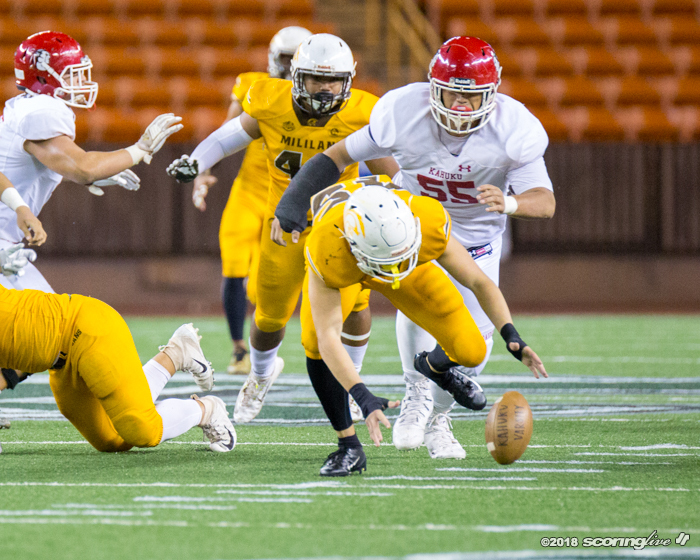 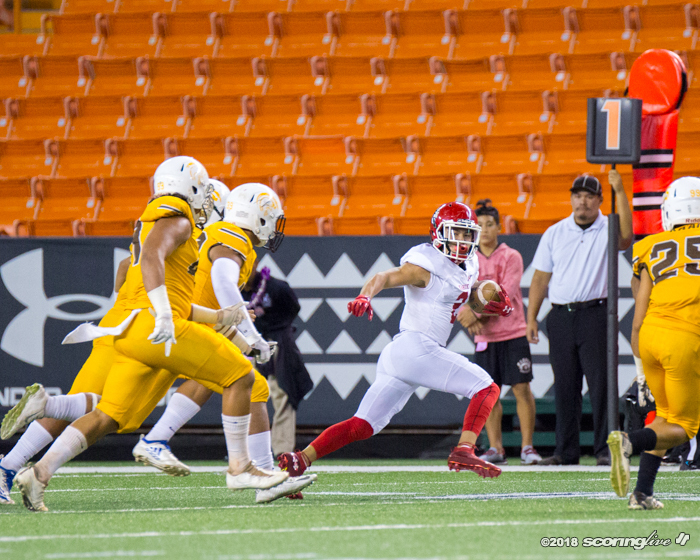 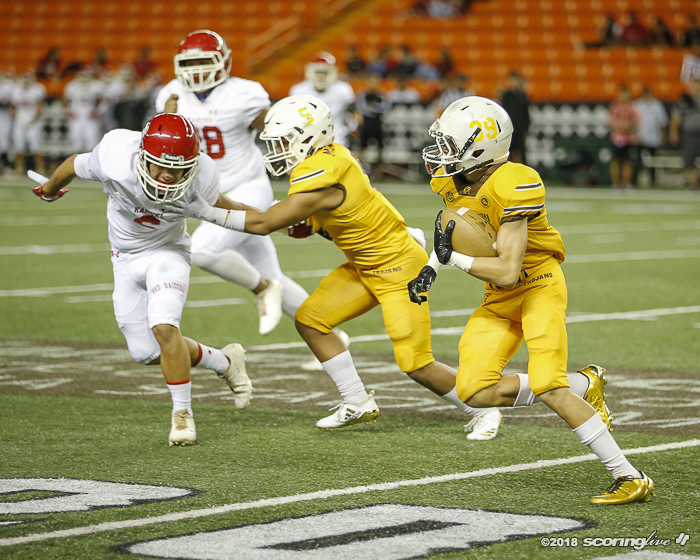 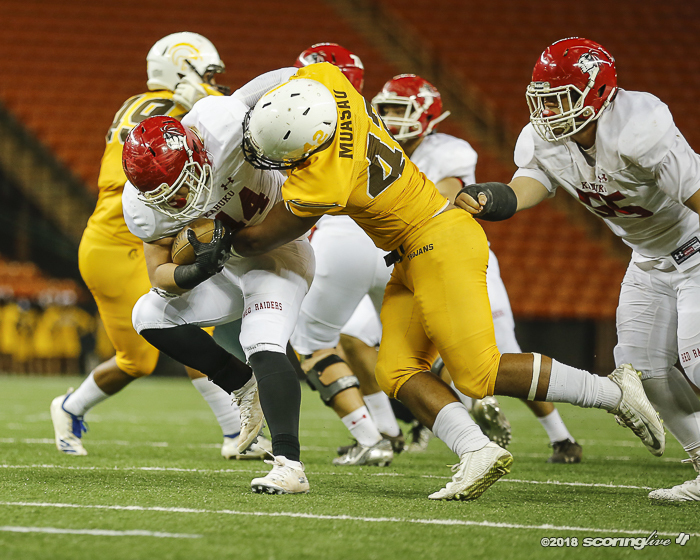 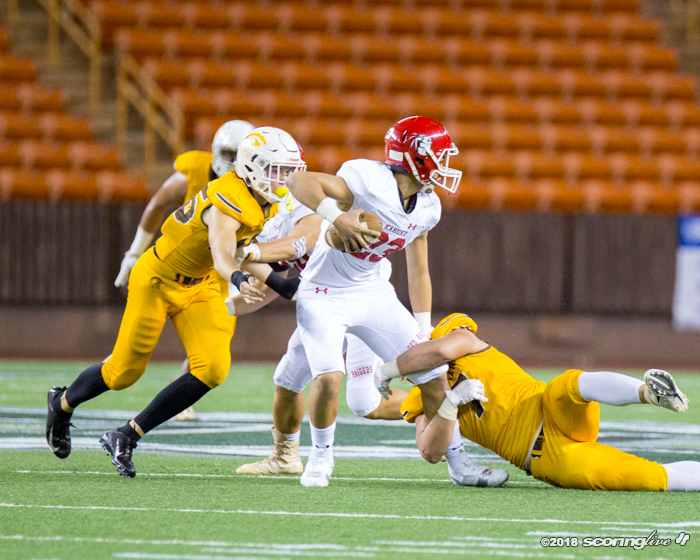 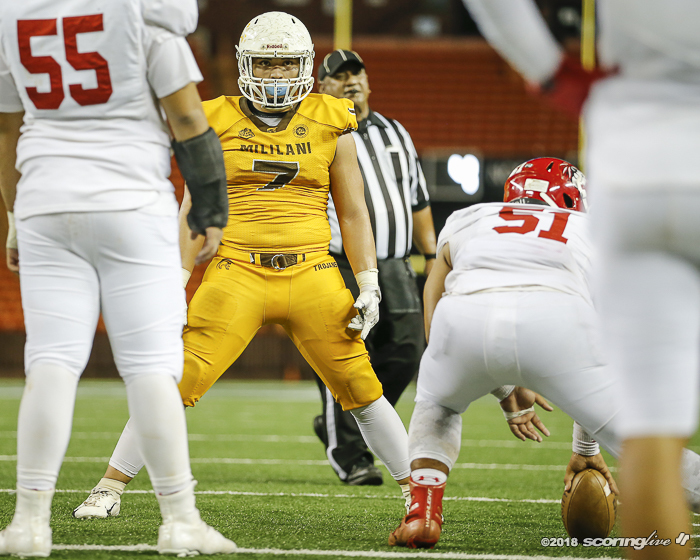 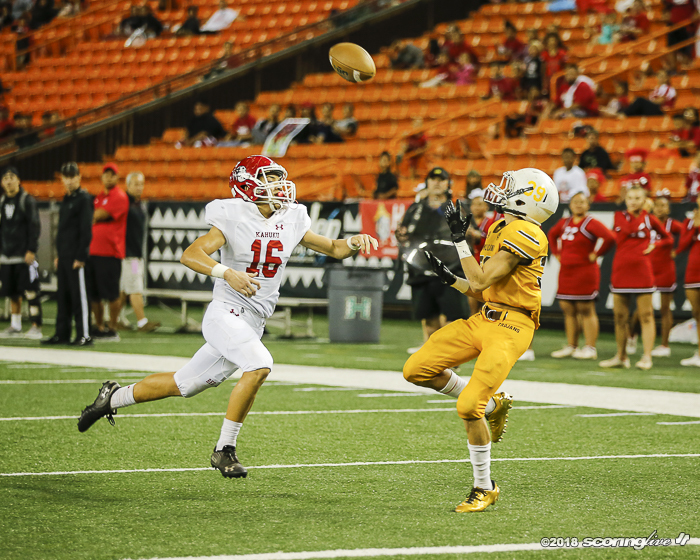 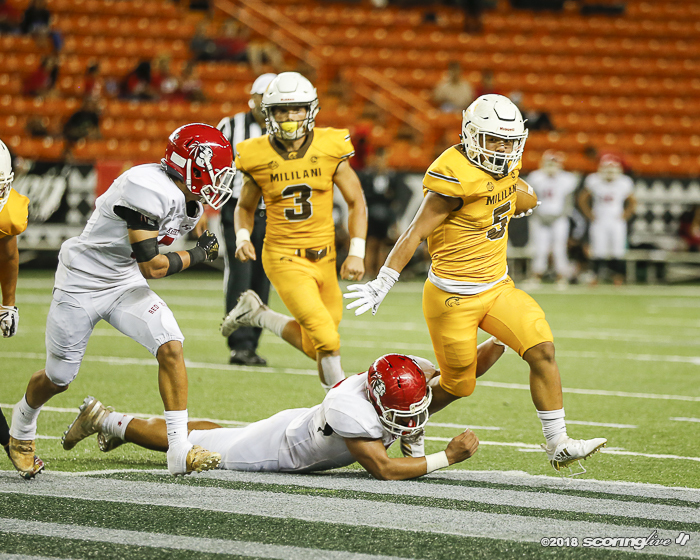 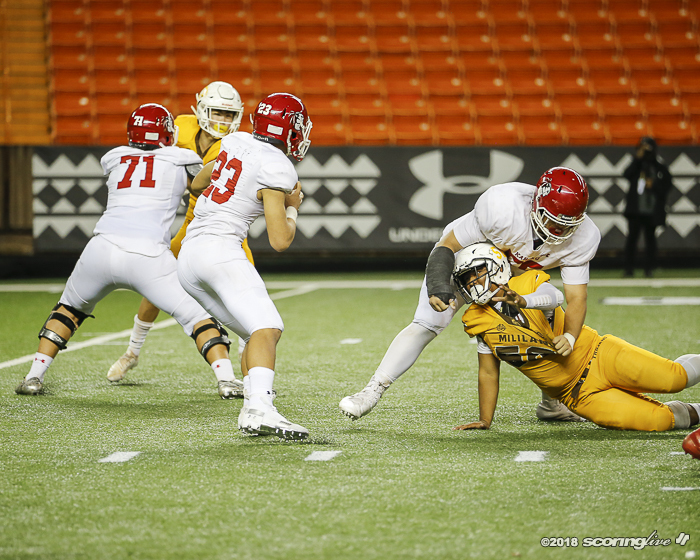 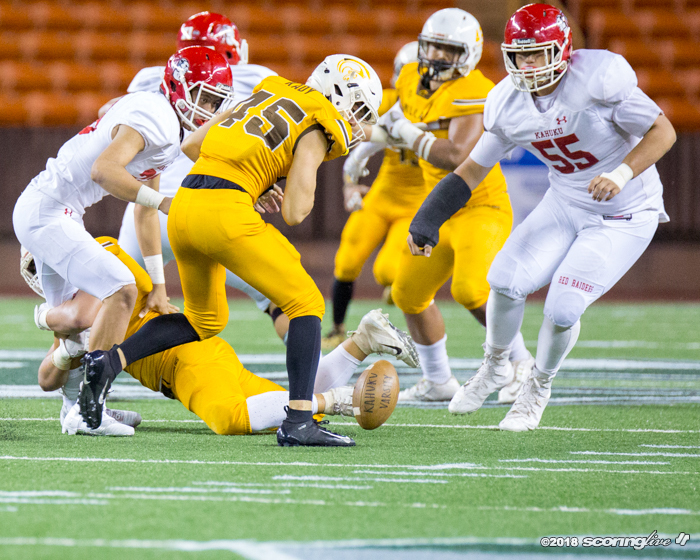 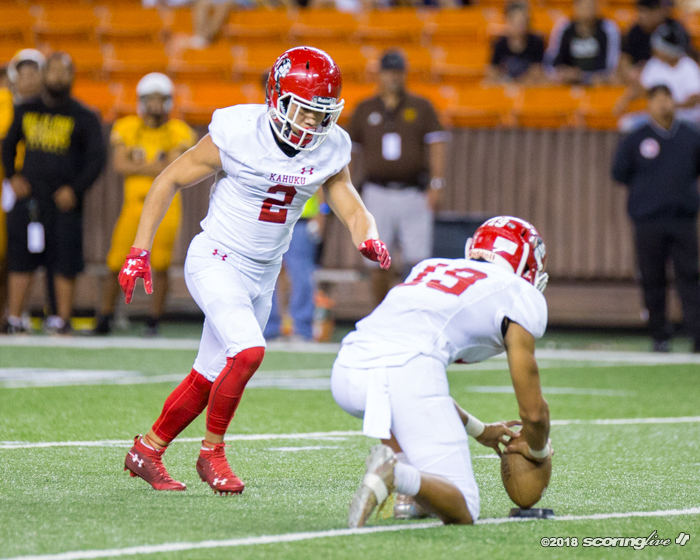 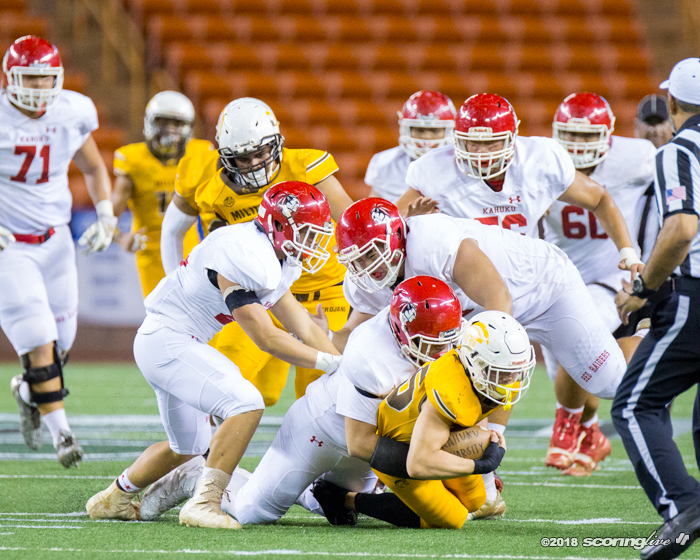 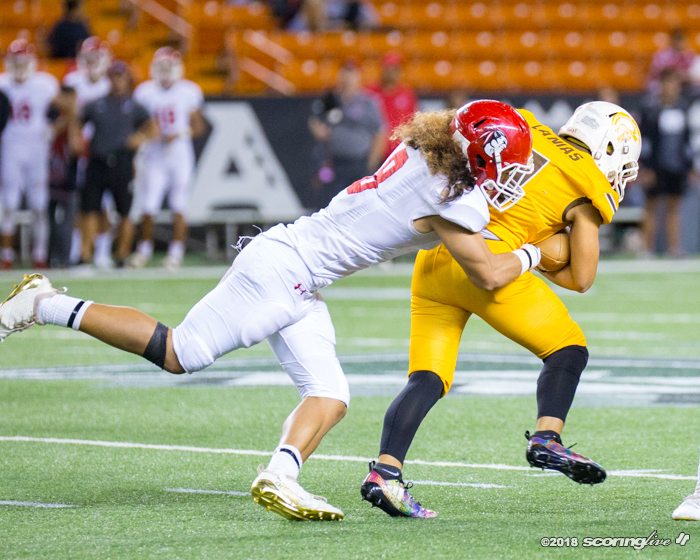 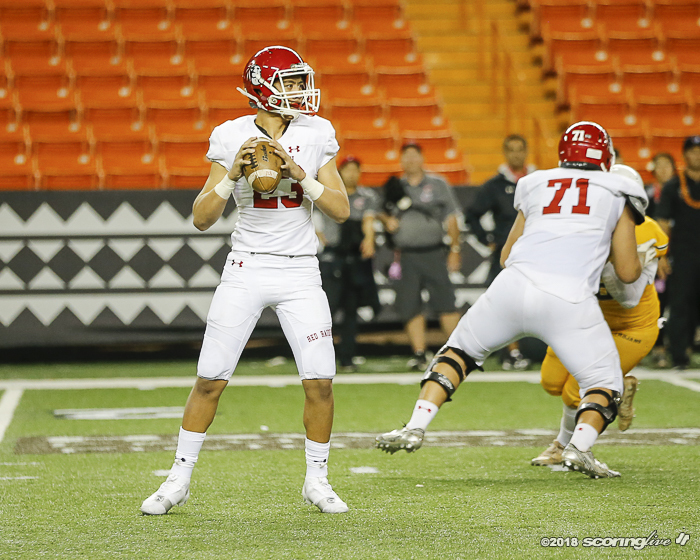 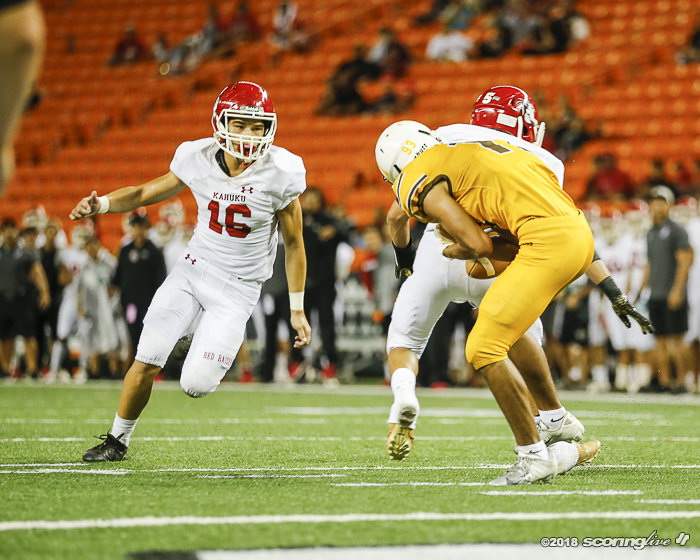 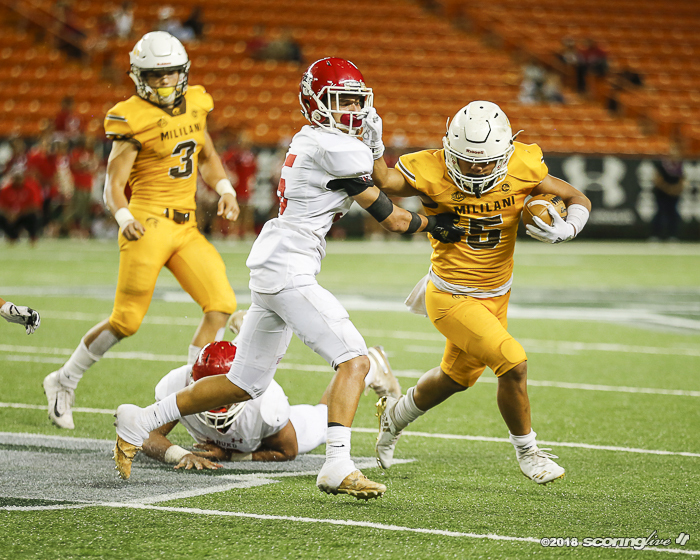 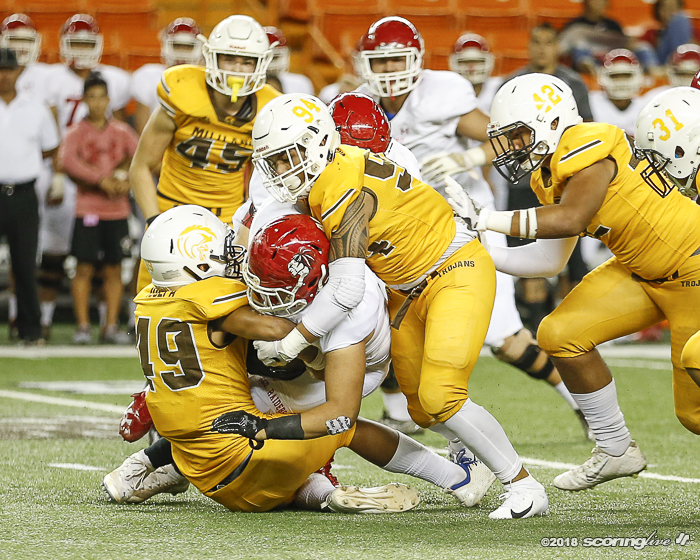 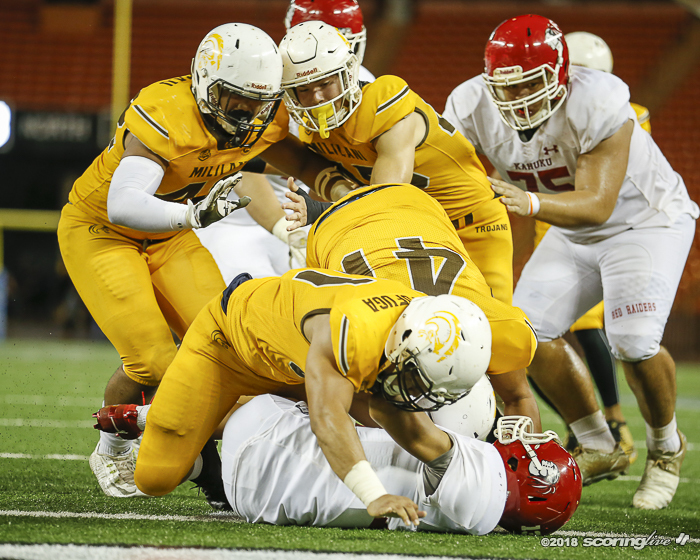 4 Kahuku in the title game of the Oahu Interscholastic Association Open Division tournament at Hawaiian Financial Federal Credit Union Field at Aloha Stadium Friday night. 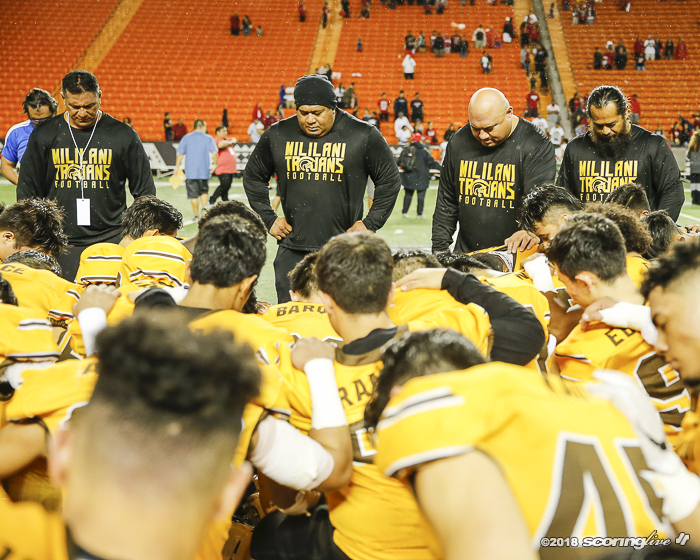 The Trojans (9-2) recorded their sixth consecutive victory and second over the Red Raiders (7-4) this season to capture their fourth league football crown and first since 2014. 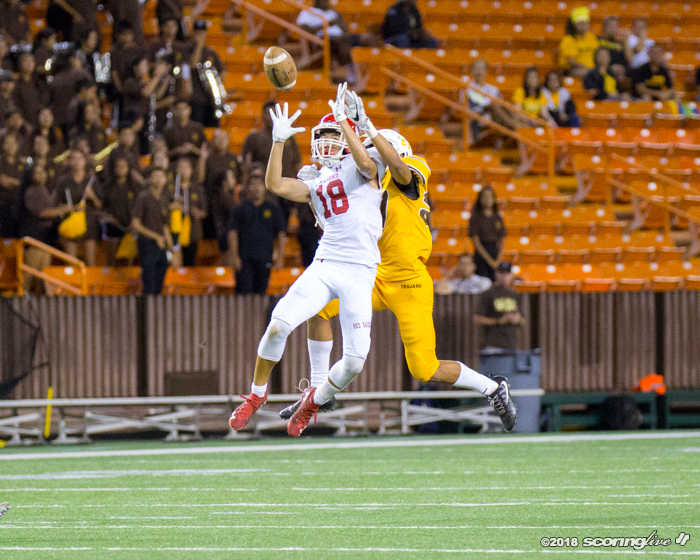 "Hats off to Kahuku, they're a great team," Mililani ninth-year coach Rod York said. 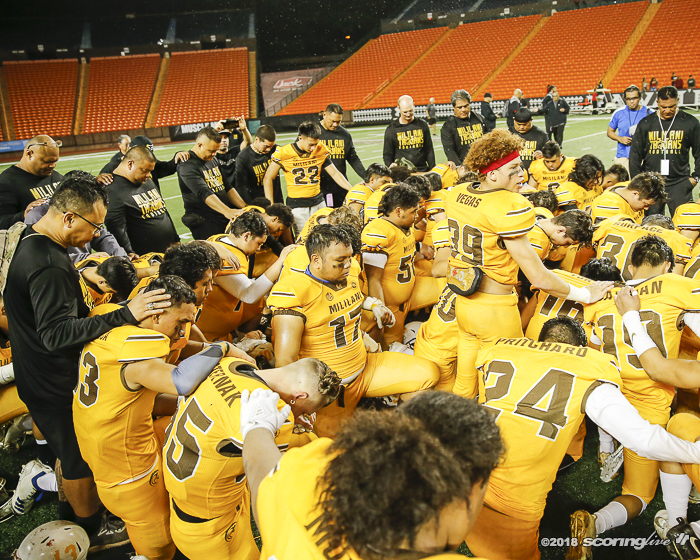 "We thank God, praise God, thank him for the glory and it's all on the kids, man. 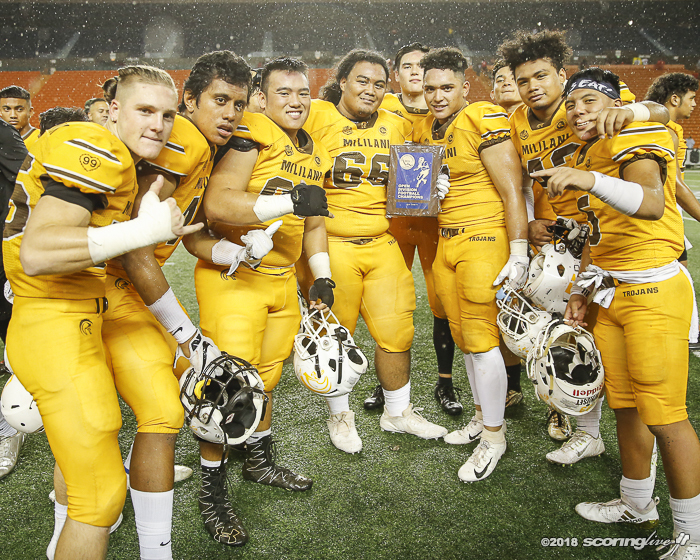 The kids brought it home today and they played well. 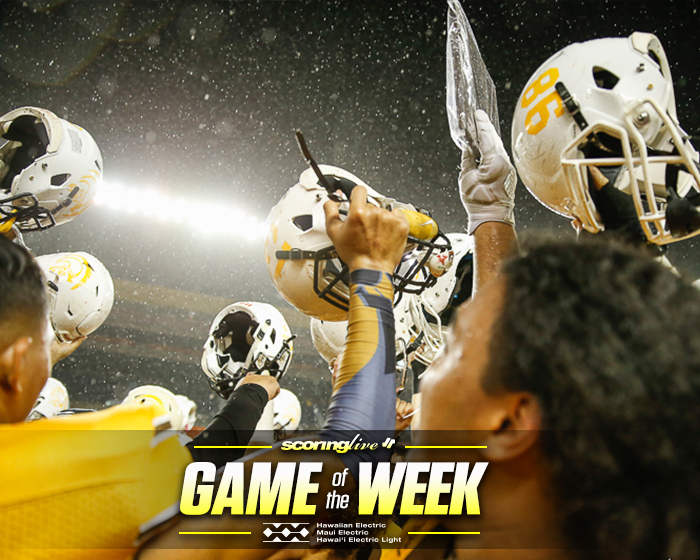 That was the difference." 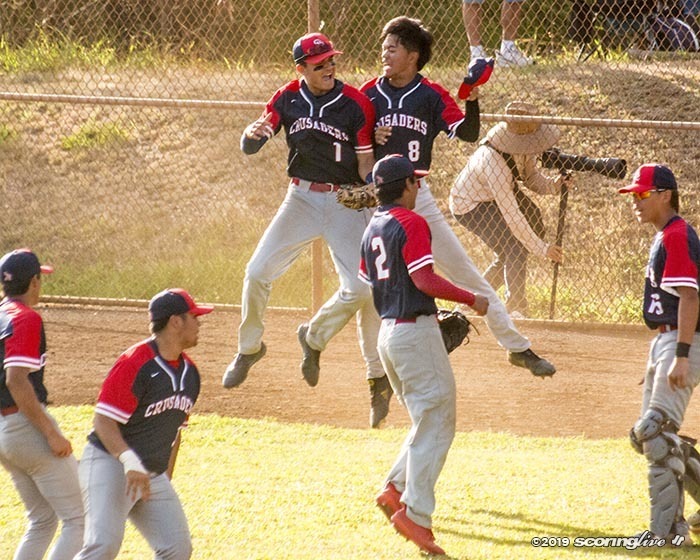 It was the second time in as many years that the teams met in a league championship game. 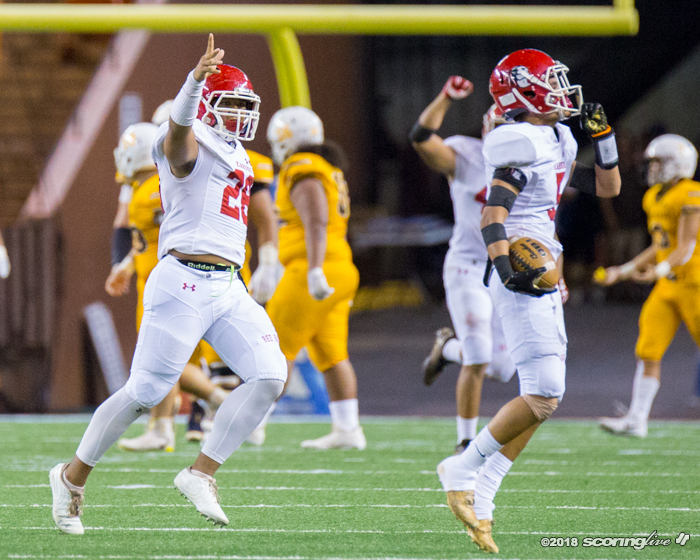 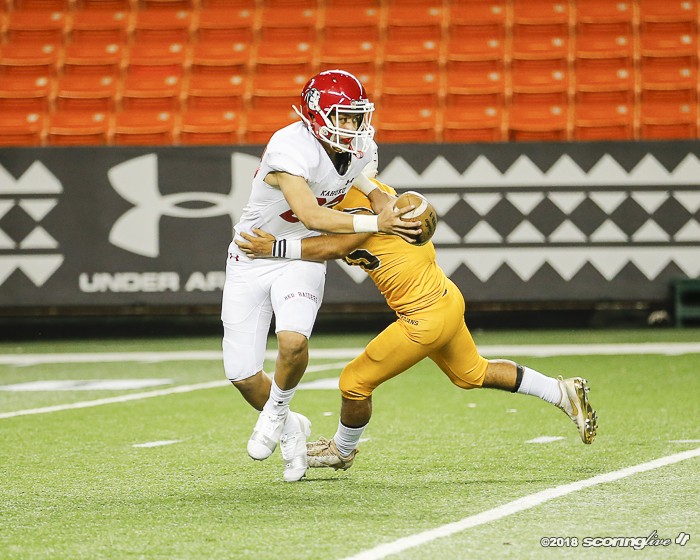 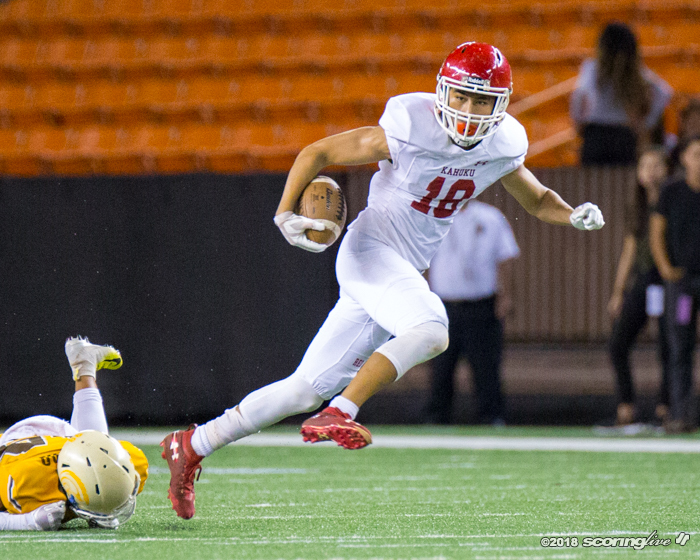 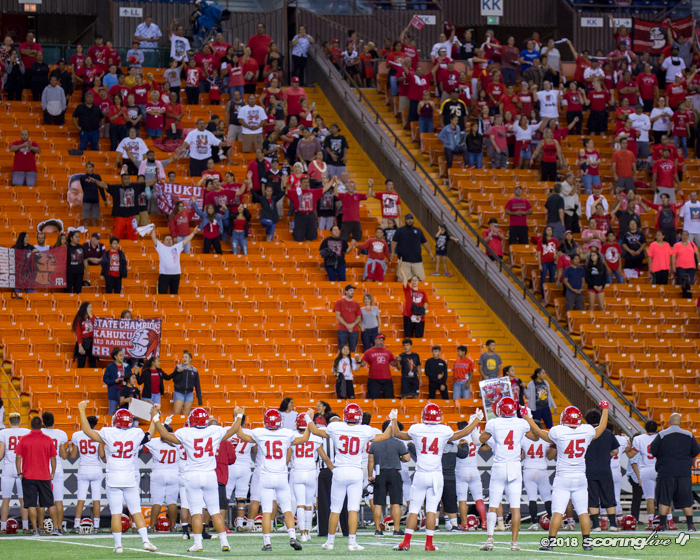 Kahuku rallied late to beat Mililani, 35-31, in last season's OIA Division I final. 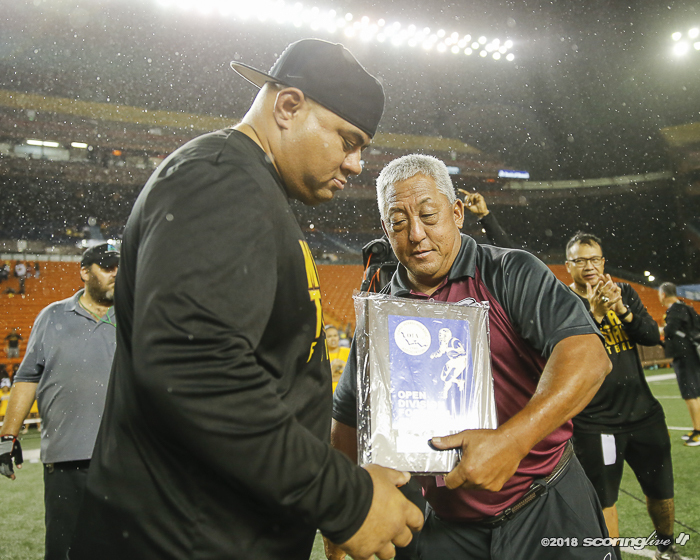 But it wasn't about revenge for the Trojans. 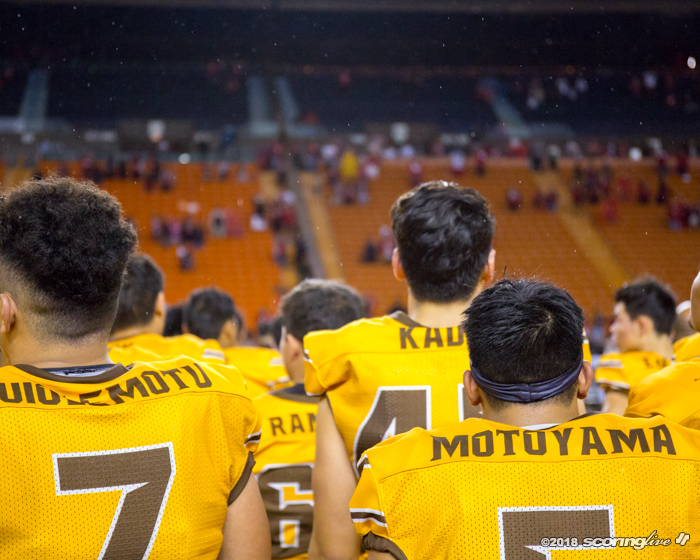 "To be honest, it's a whole new year and we're just focused on this year," said Gabriel, a senior quarterback. 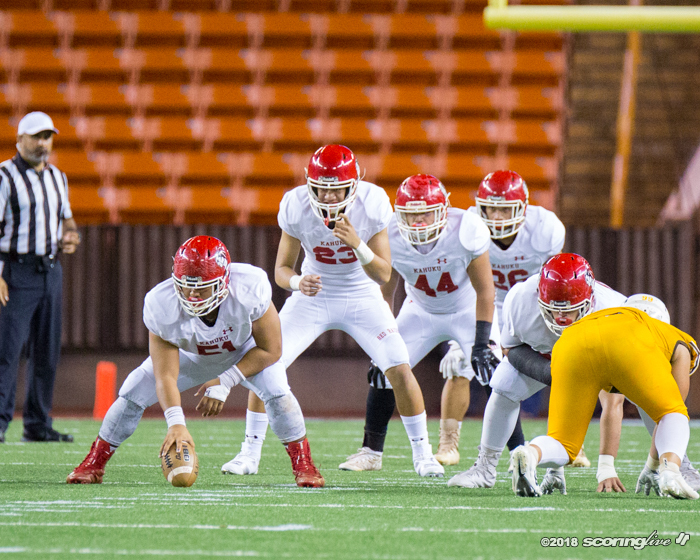 "Kahuku is a great team. 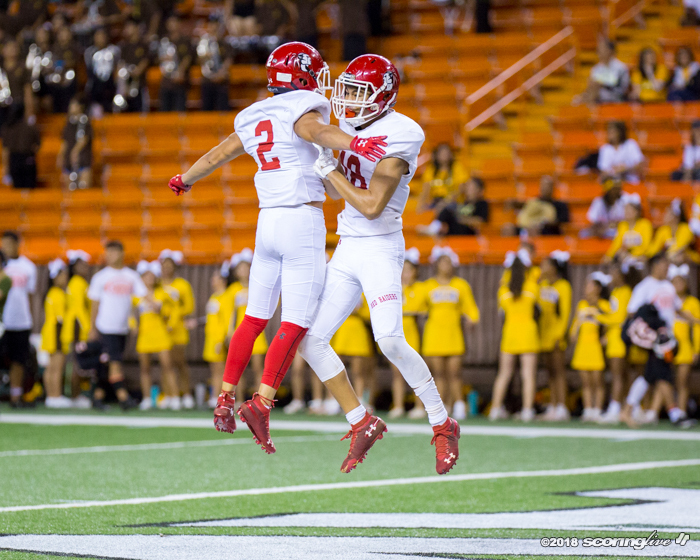 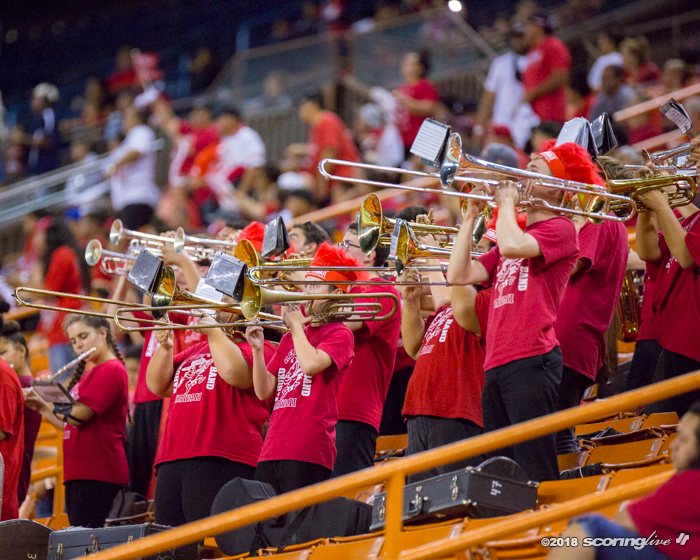 I think they come out with a sense of energy that makes the game fun and shout out to Kahuku, they played a great game." 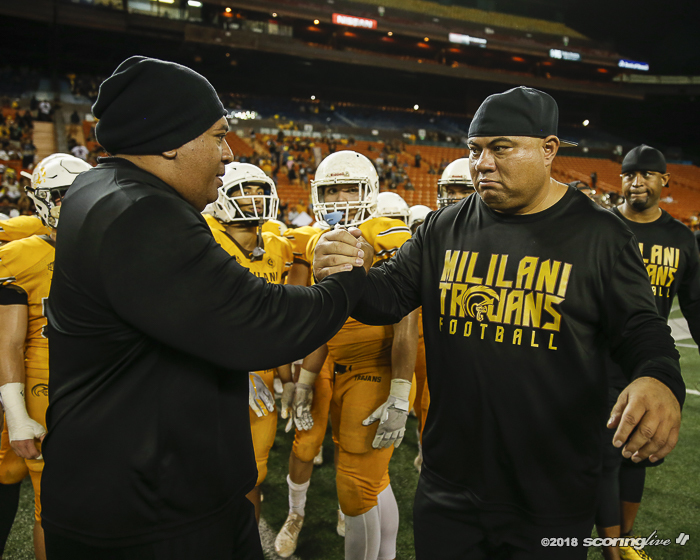 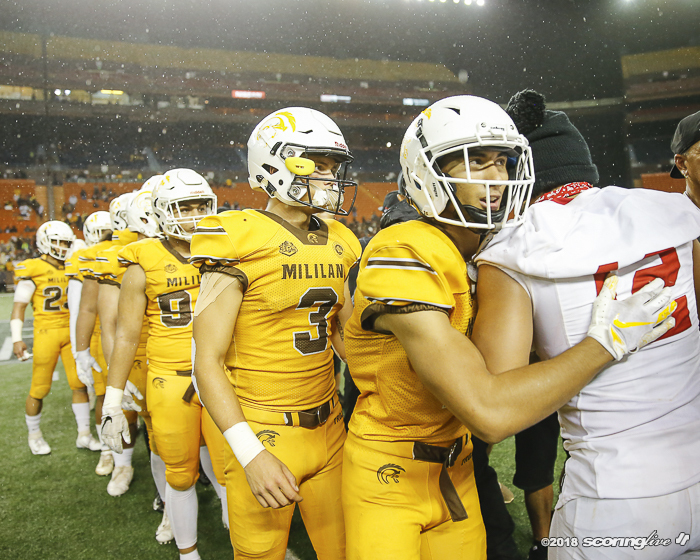 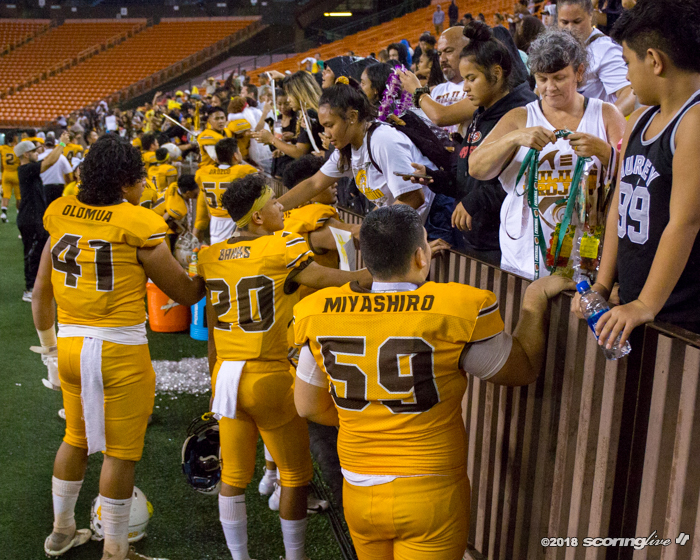 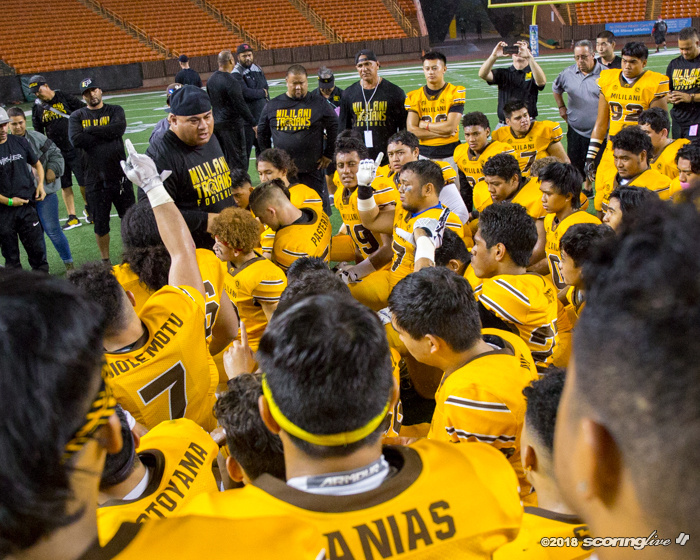 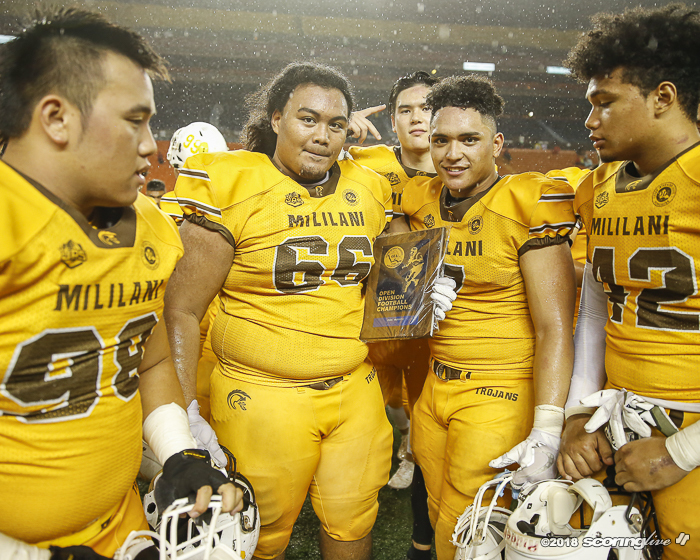 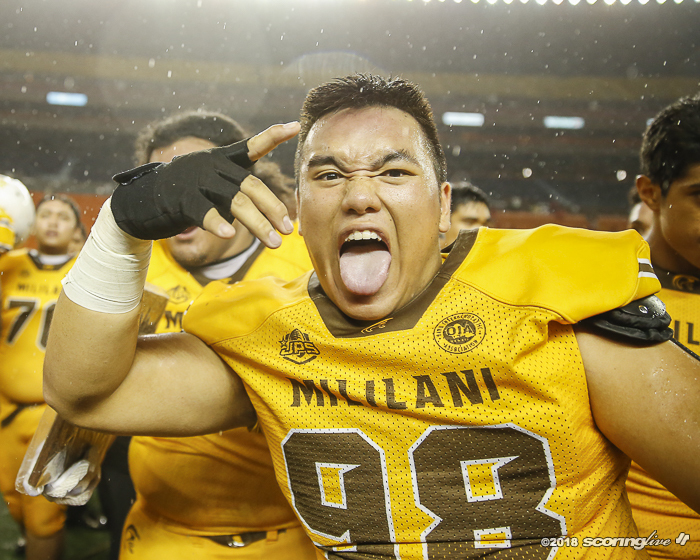 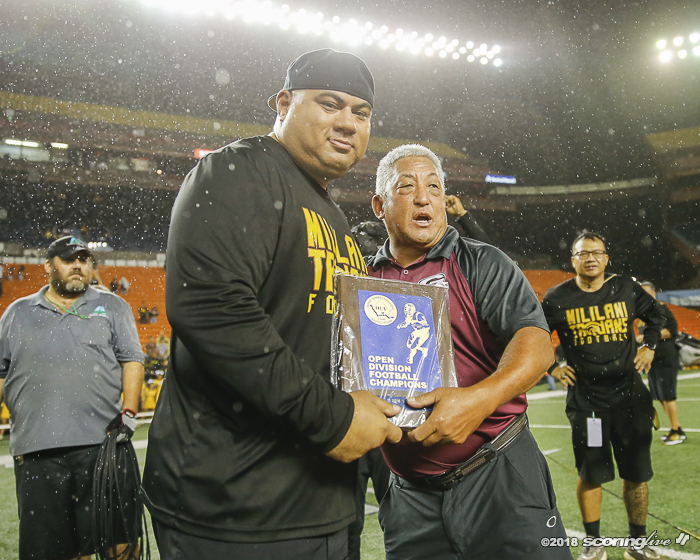 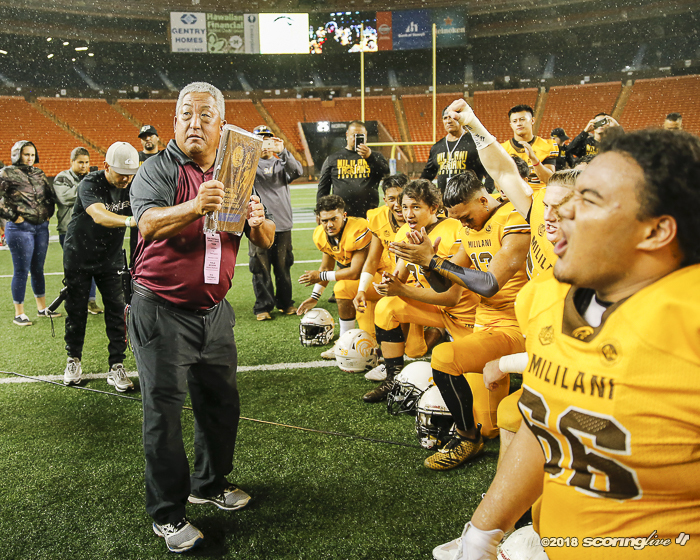 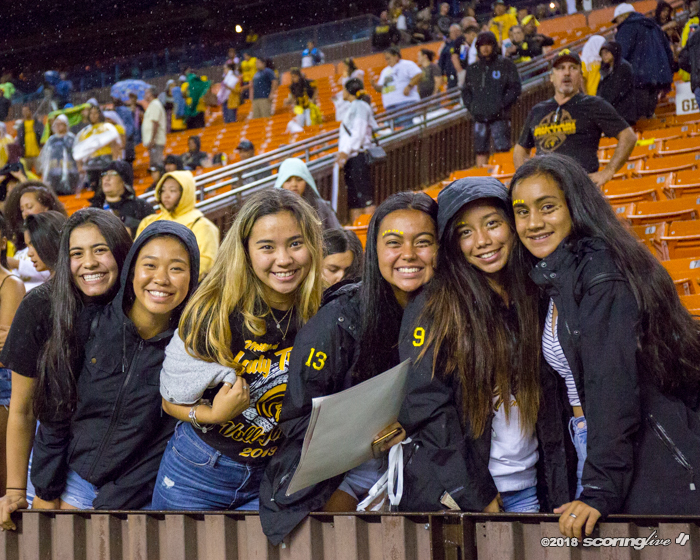 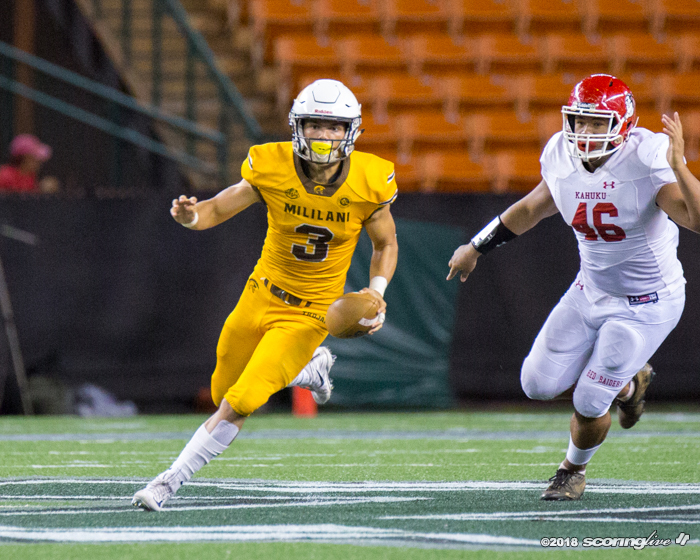 Ultimately, the night belonged to Mililani. 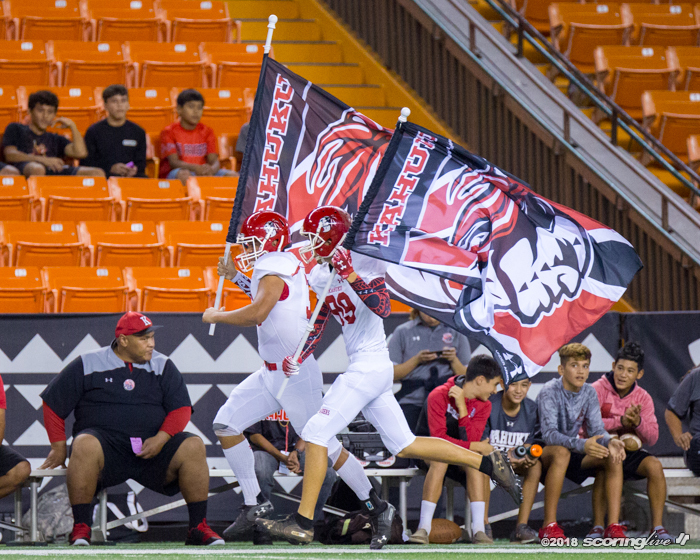 Offensively, the Trojans amassed 433 yards of total offense, while their defense turned in a stellar game, shutting down Kahuku to the tune of minus-37 rushing yards and just 88 total yards. 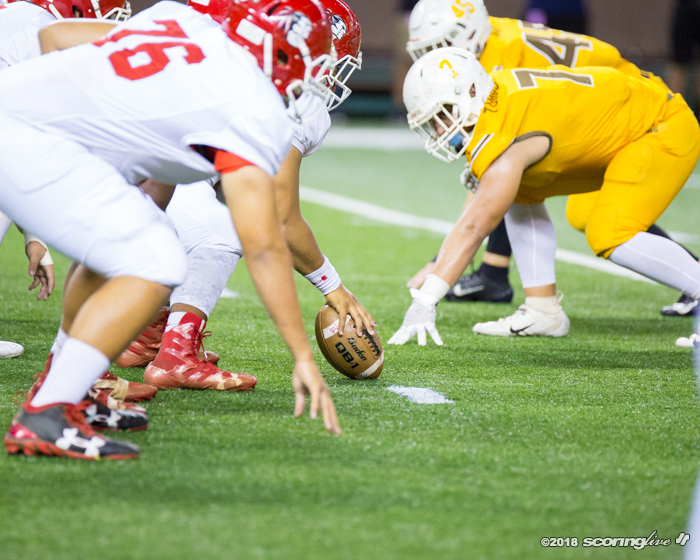 "Our defense is our key to our team. 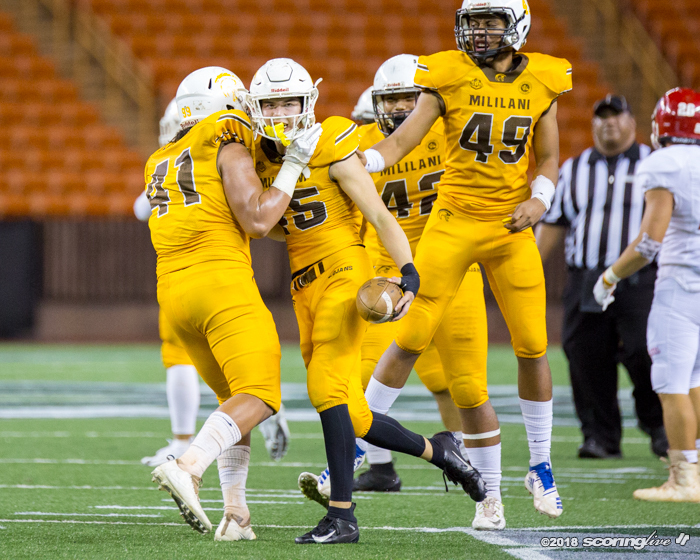 When they play great they give the offense the ball and they give us opportunities to score, so they're the reason we're winning," Gabriel said. 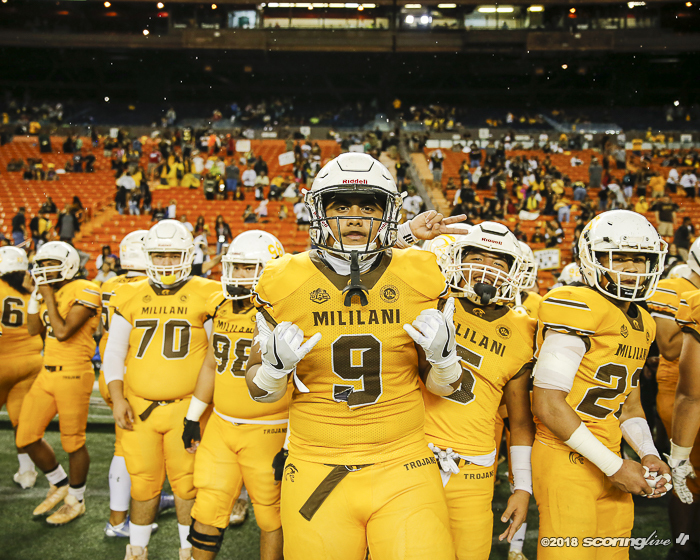 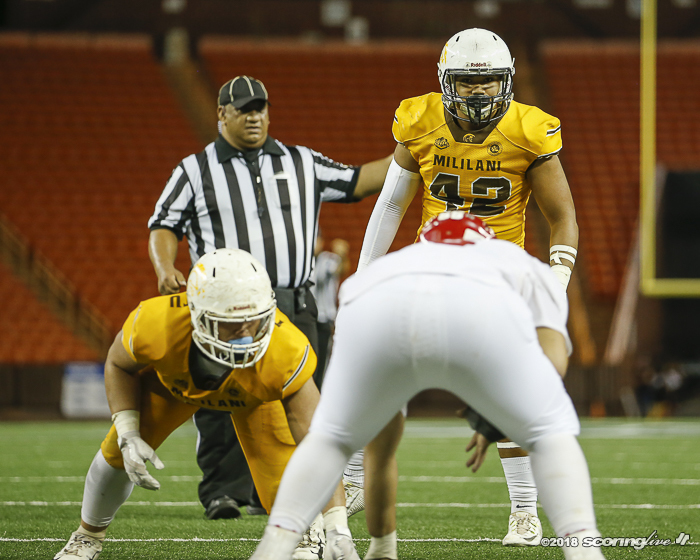 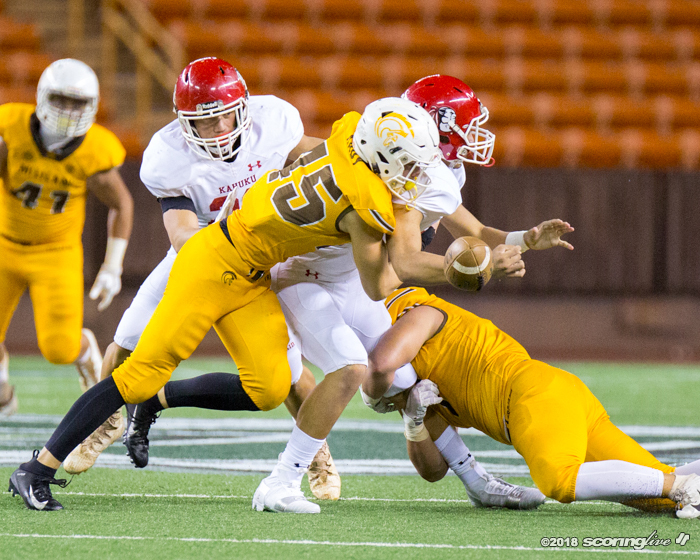 Mililani racked up eight sacks on Kahuku quarterbacks Robbie Sauvao and Thorton Alapa — three of them by defensive end Shane Kady and two others by linebacker Muelu Iosefa — and surrendered only eight first downs for the game. 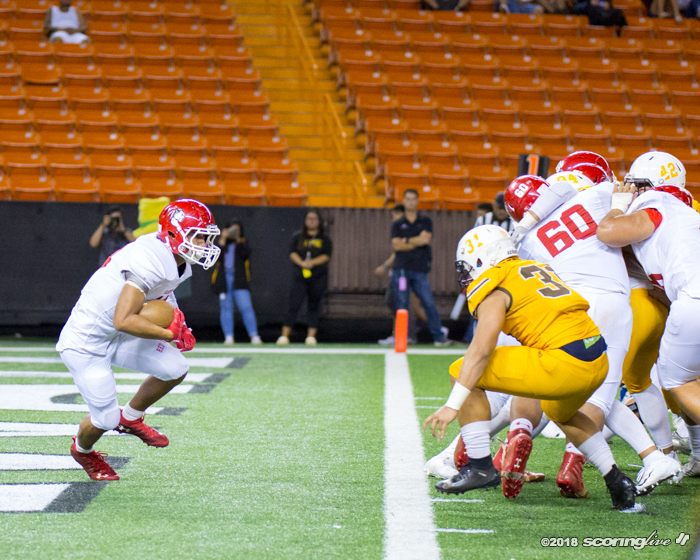 Kahuku did not rush for a first down. 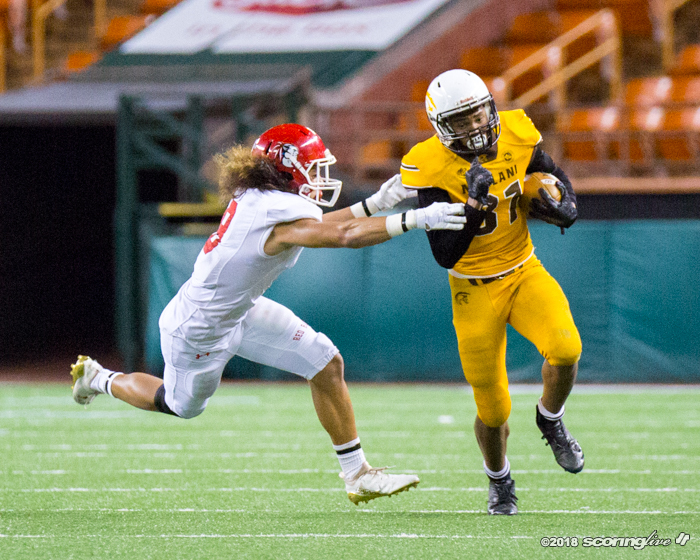 "The defense set it up for us and the offense punched it in when we needed to," York said. 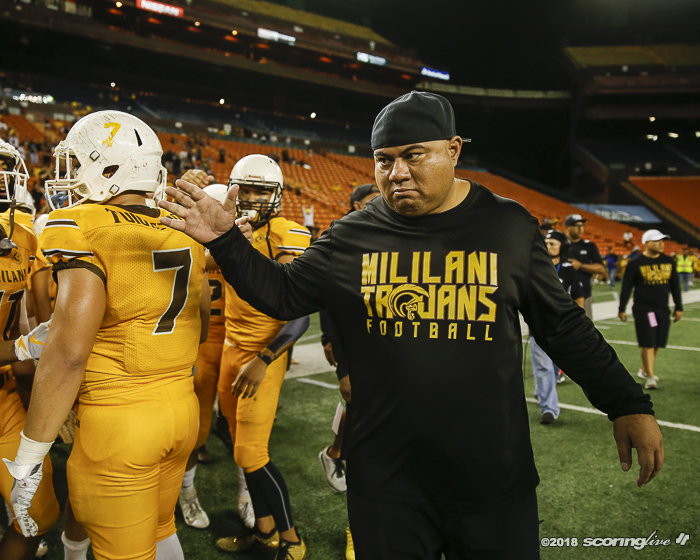 The Trojans wasted little time getting on the scoreboard. 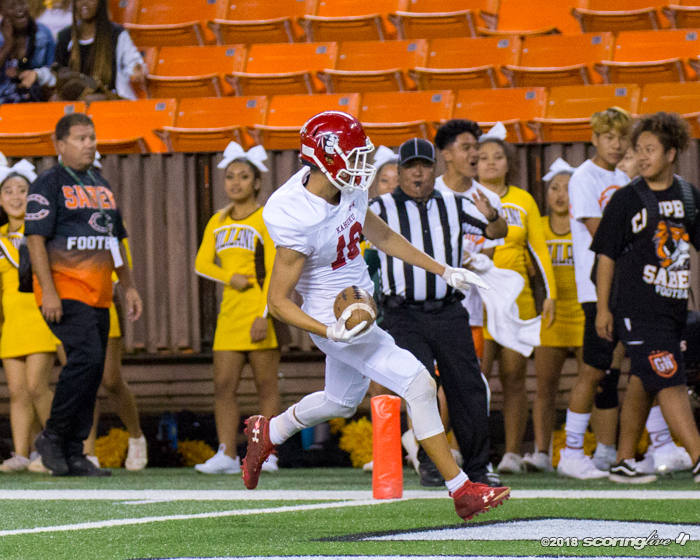 On just their fourth play from scrimmage, Gabriel rolled out to his left away from oncoming pressure and released a high, lofted pass down the left sideline for a wide-open Ryan Chang, who scored easily on the 67-yard touchdown pass 62 seconds into the game. 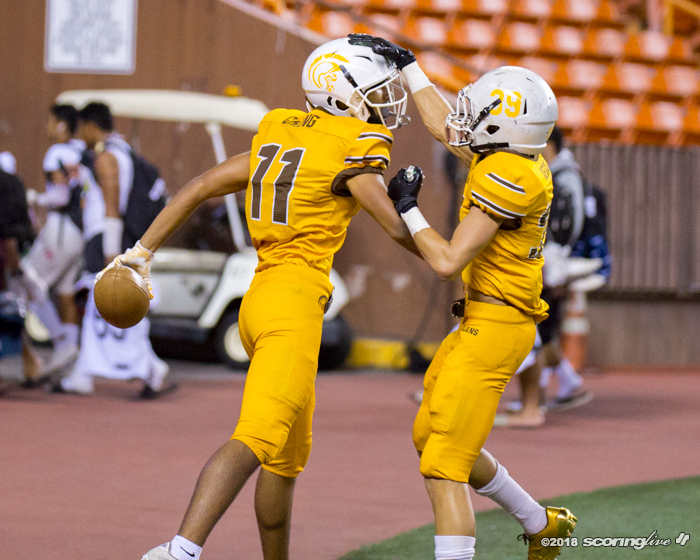 Chang finished with a game-high six receptions for 133 yards but dropped a well-placed Gabriel pass on the first play of the game. 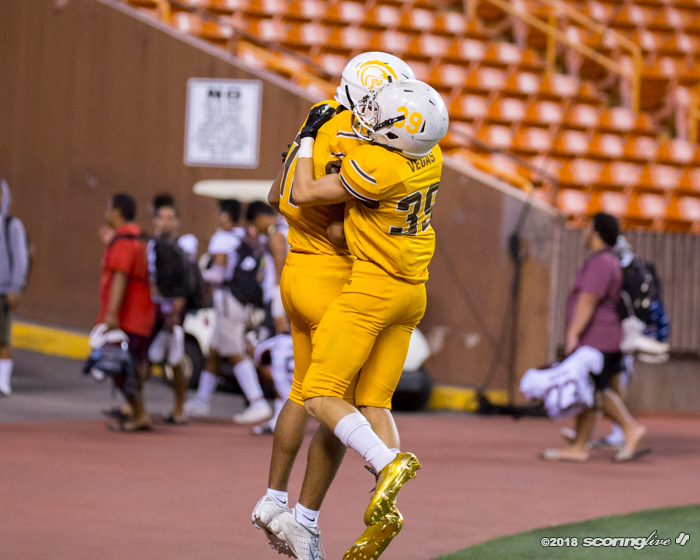 Gabriel went right back to Chang for a 13-yard pass on the very next snap, and two plays later, the duo hooked up on the long TD pass. 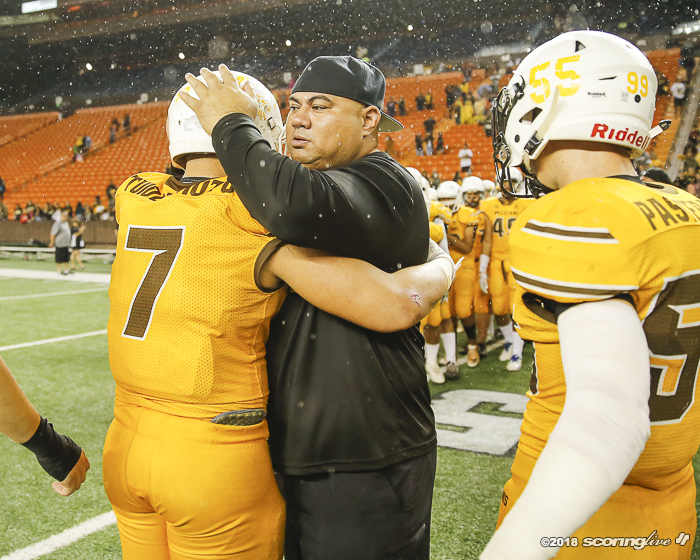 "The thing is we kind of instilled this emotionless game where it's just about the next play. 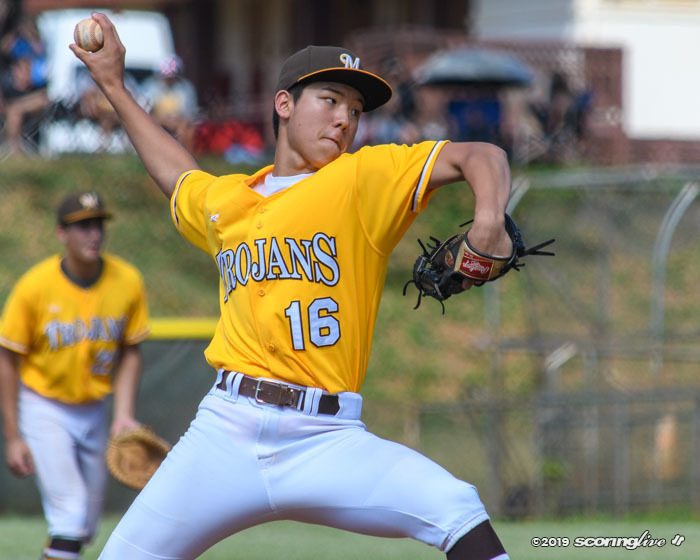 Forget what happened the previous play because you can't get it back so we're just focused on the present and what the future holds," said Gabriel, a 6-foot, 190-pound southpaw. 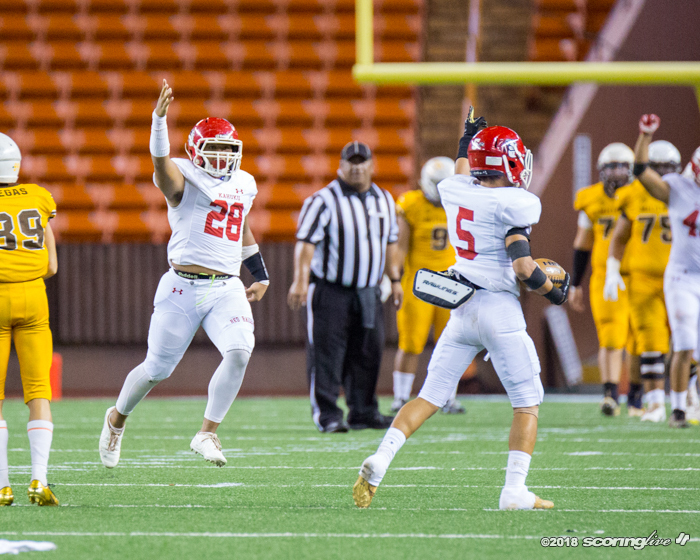 Kahuku's lone score — a 60-yard TD pass from Sauvao to Mason Paulo on a third-and-4 early in the second quarter — tied the score at 7. 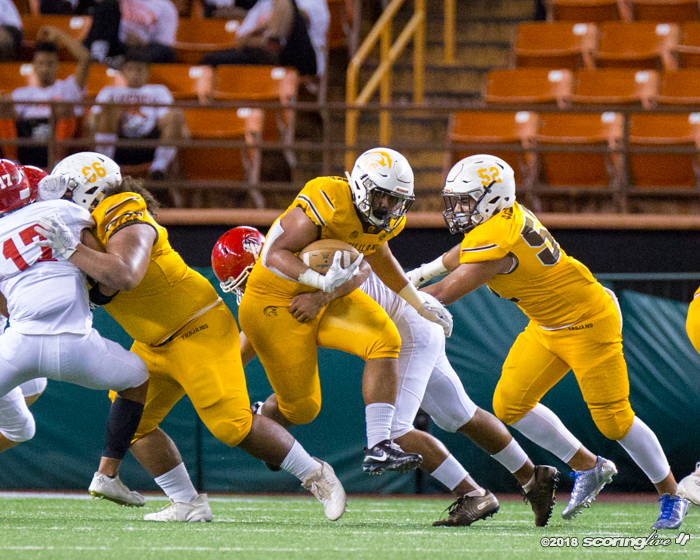 The Raiders were unable to capitalize on a pair of defensive takeaways. 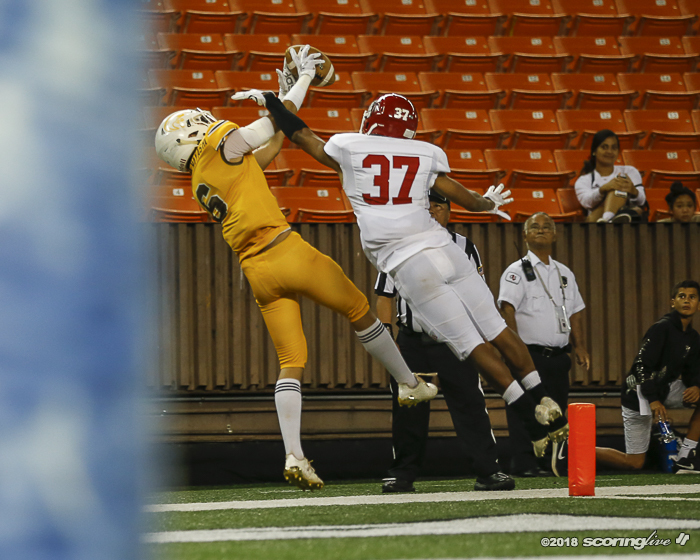 Frisco Aveau intercepted Gabriel to give the offense the ball back at their own 45-yard line. 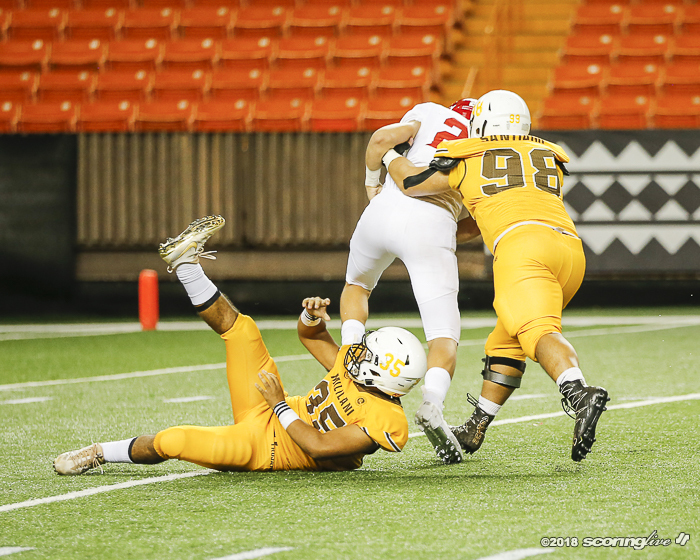 However, two plays later, Sauvao was sacked by Kady, who also forced and recovered a fumble on the play. 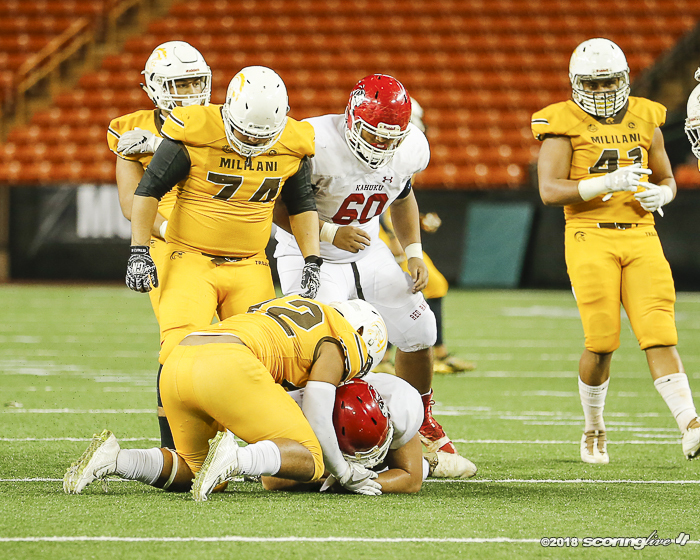 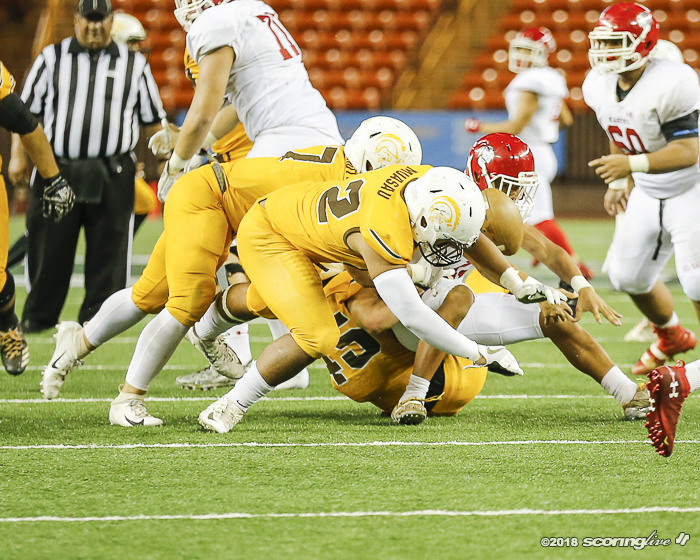 Mililani gave the ball right back one play into its ensuing possession when Gabriel was picked off by Joseph Taufa near the goal line. 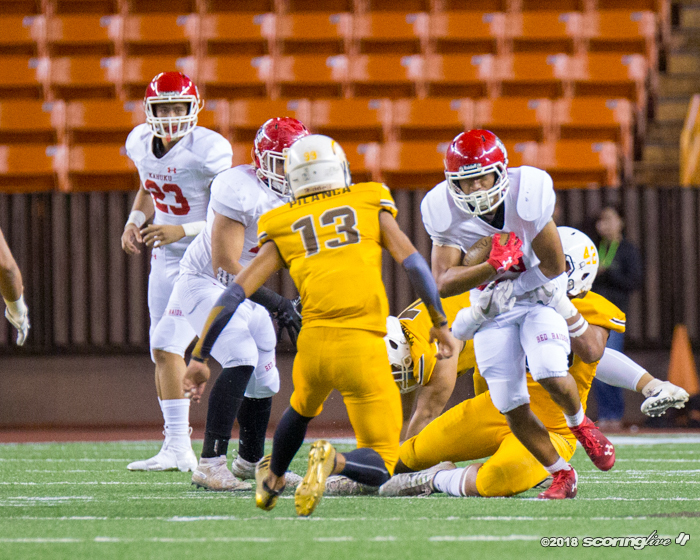 Kahuku eventually drove to the Trojans' 45 but were forced to punt away. 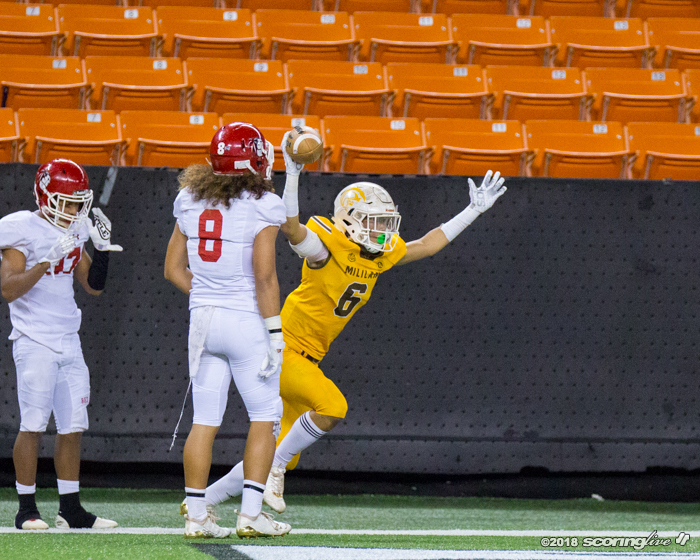 Four plays later, Gabriel hooked up with Cy Kuboyama-Hayashi on a 29-yard TD pass in the right, front corner of the end zone. 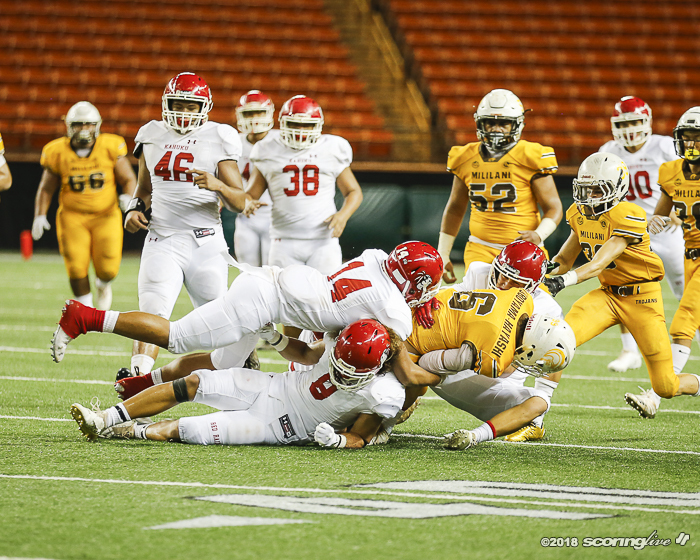 "It hurt," Kahuku first-year coach Sterling Carvalho said of the missed opportunities. 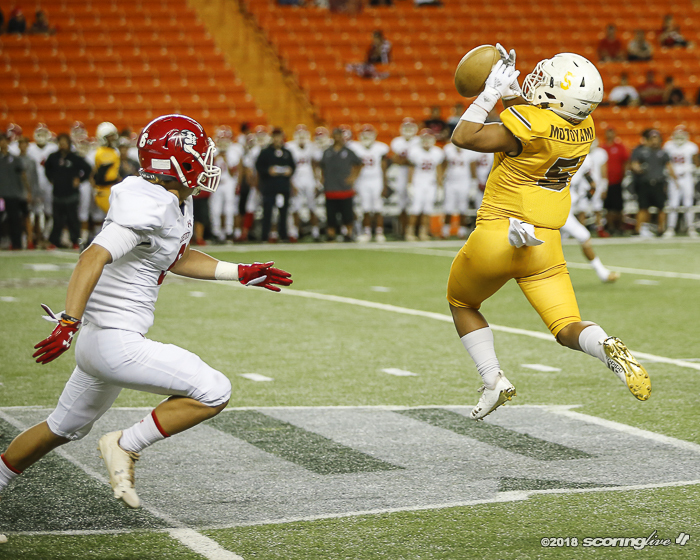 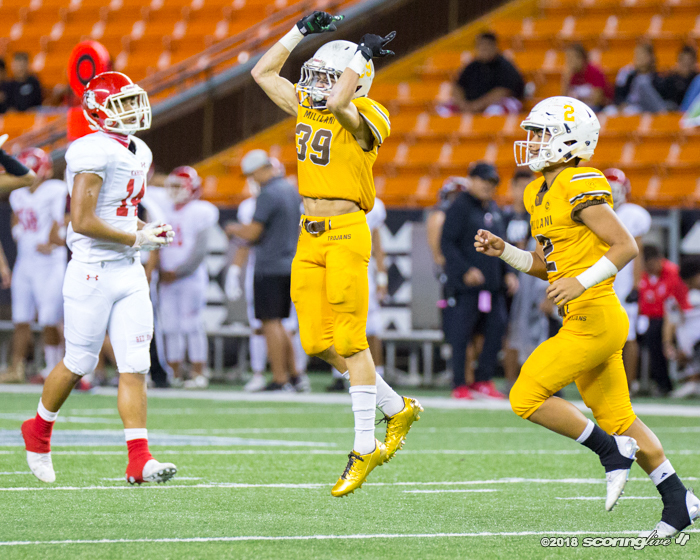 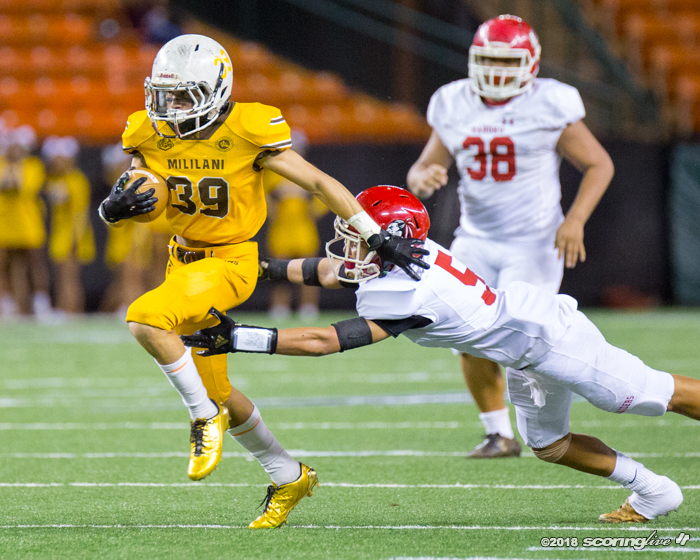 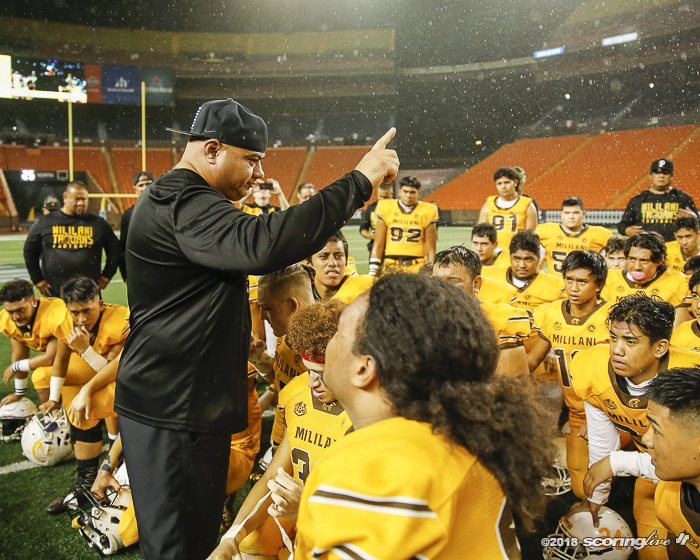 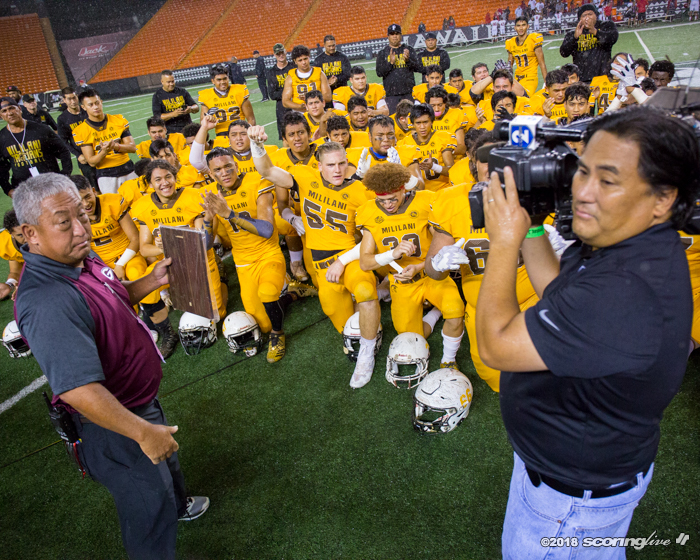 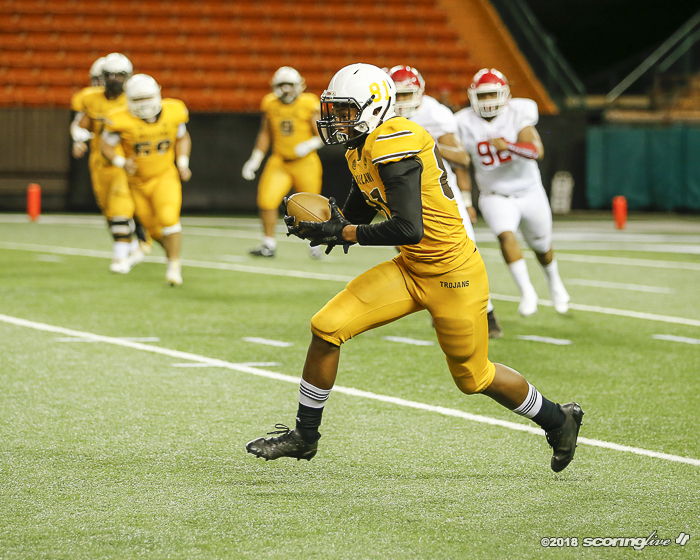 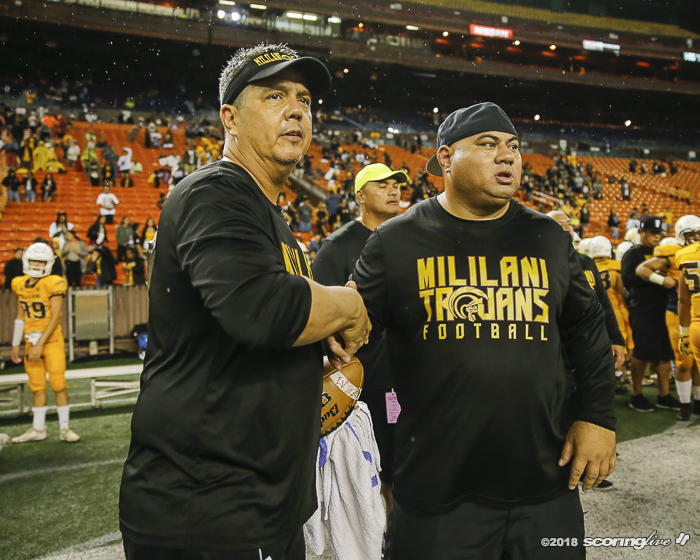 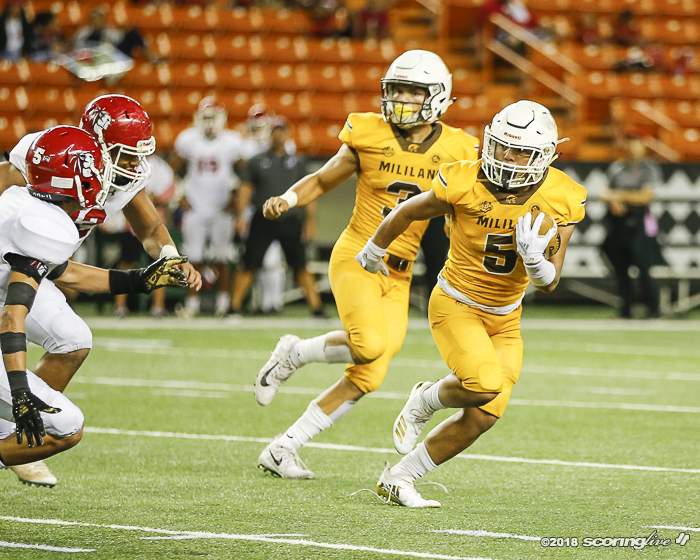 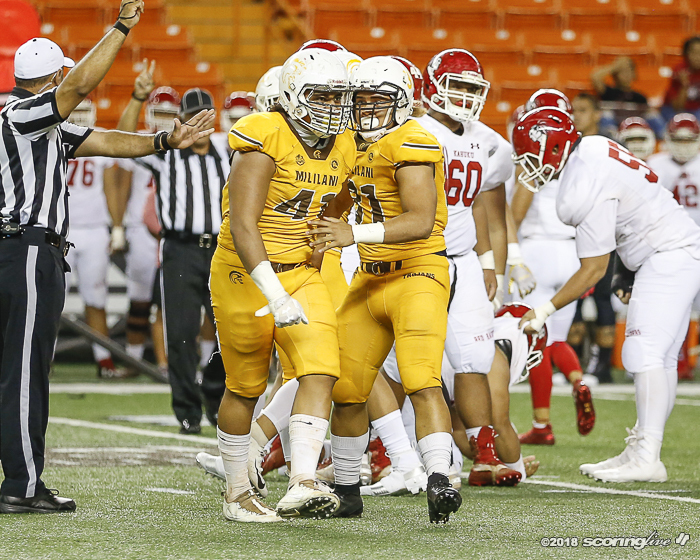 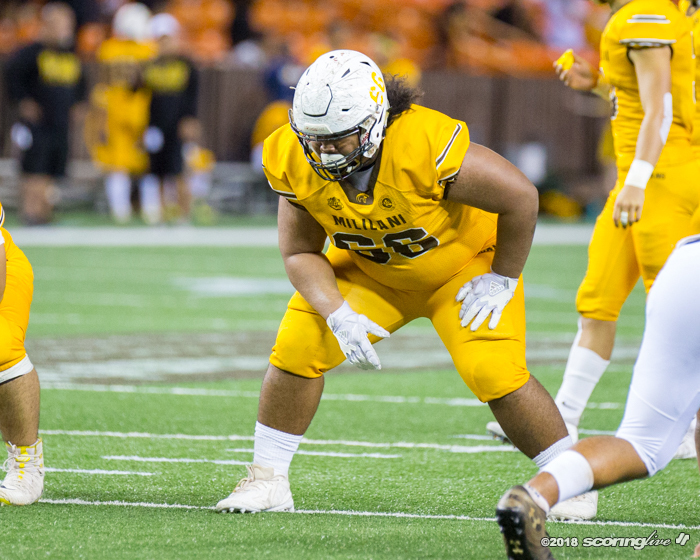 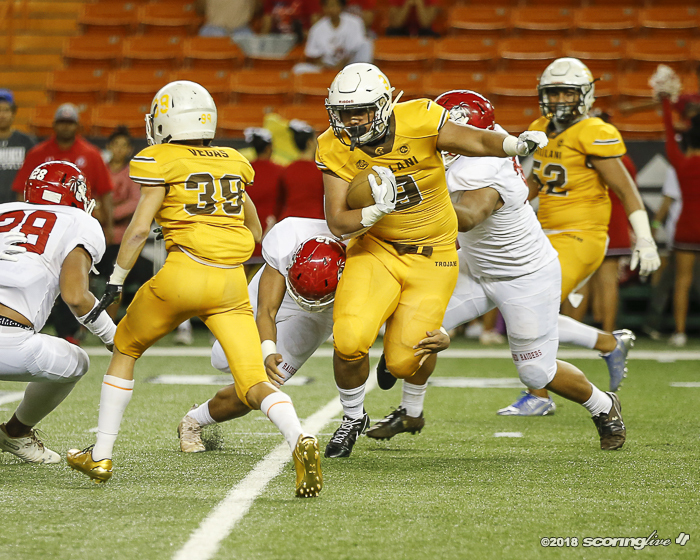 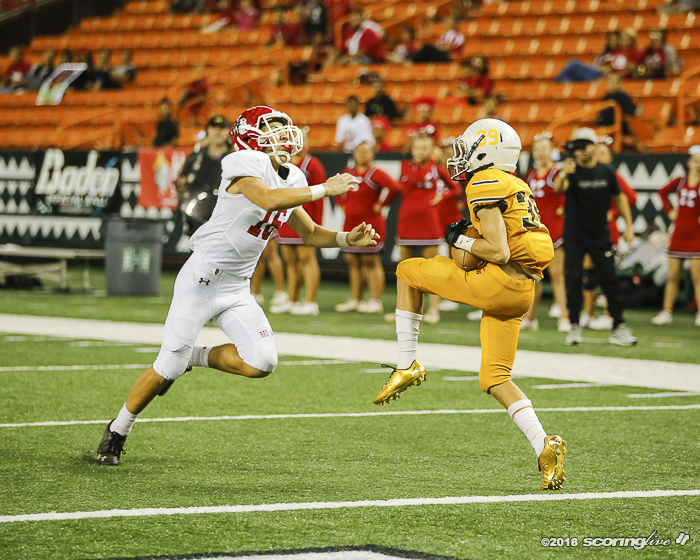 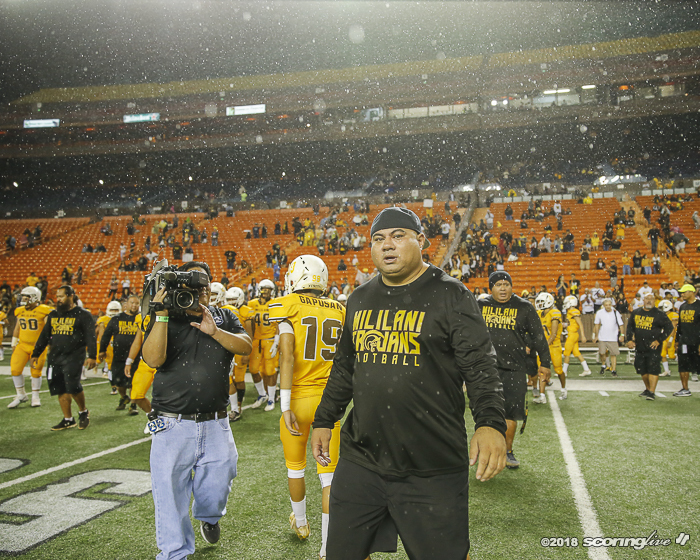 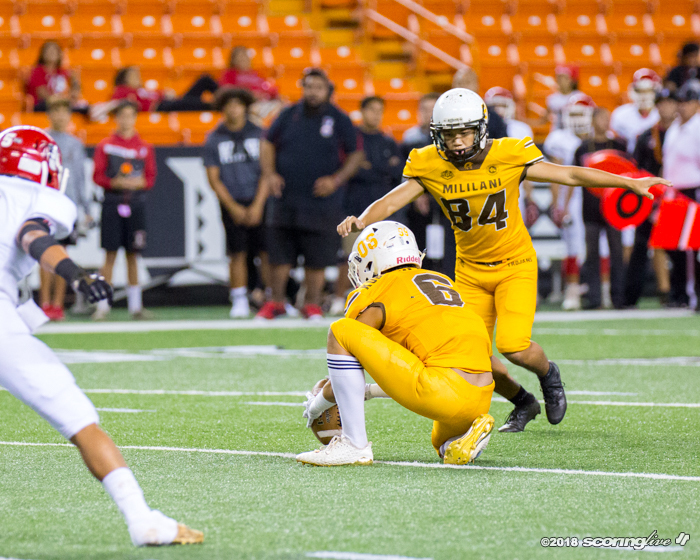 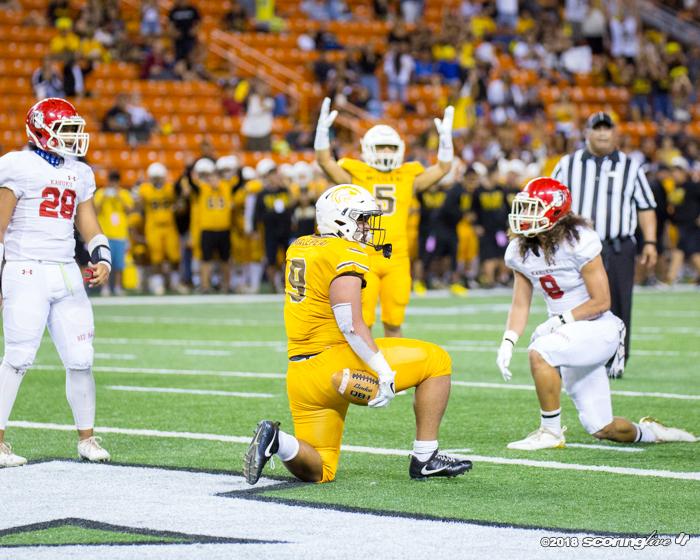 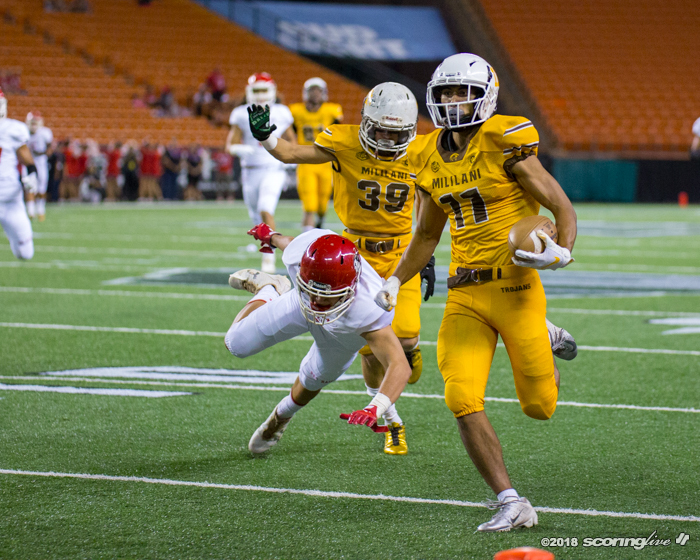 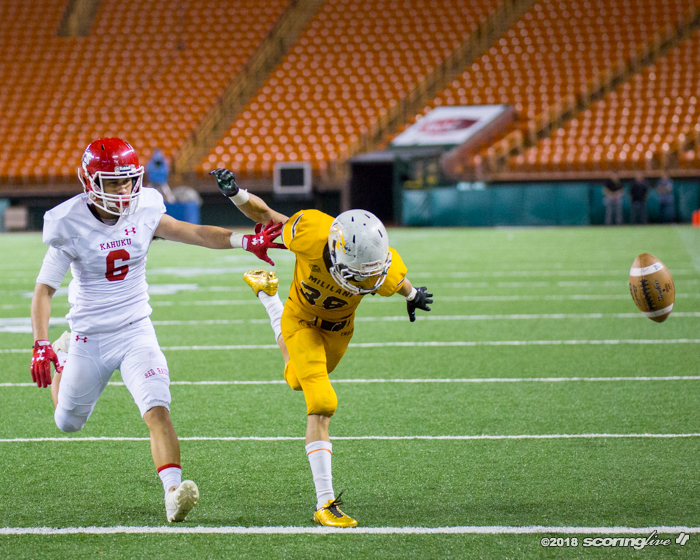 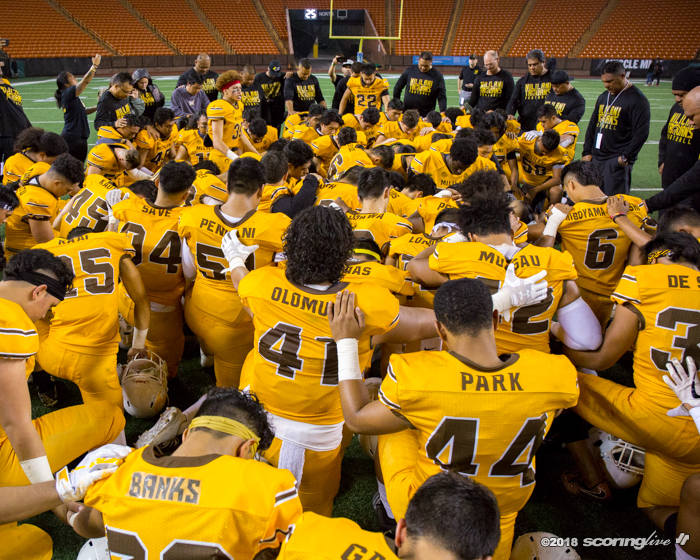 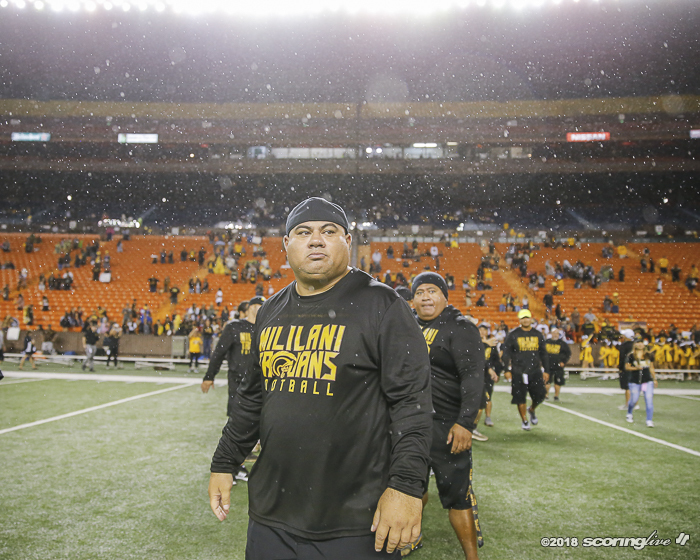 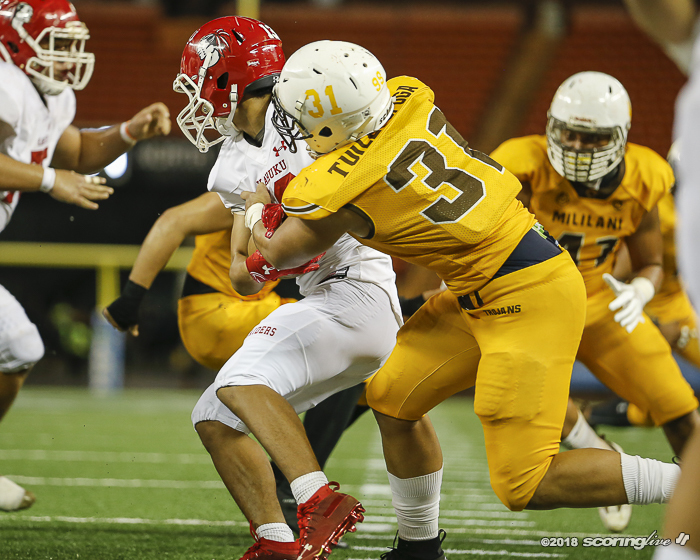 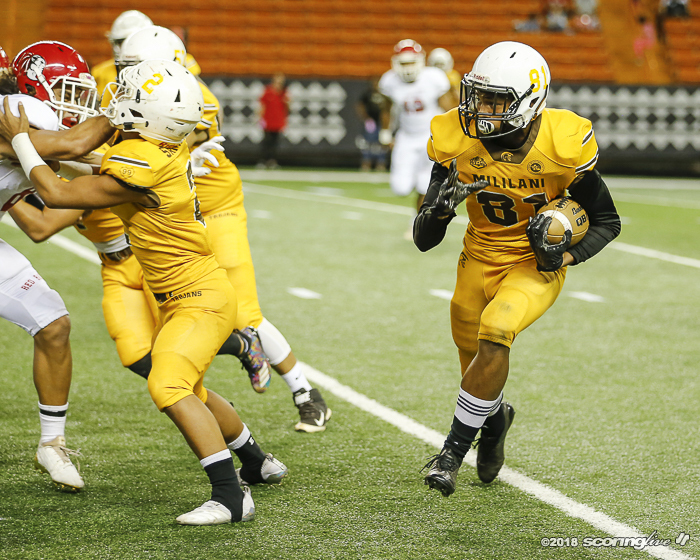 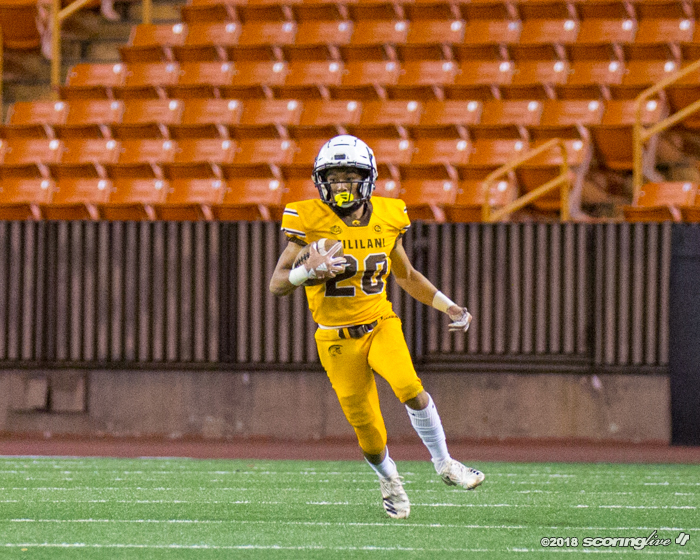 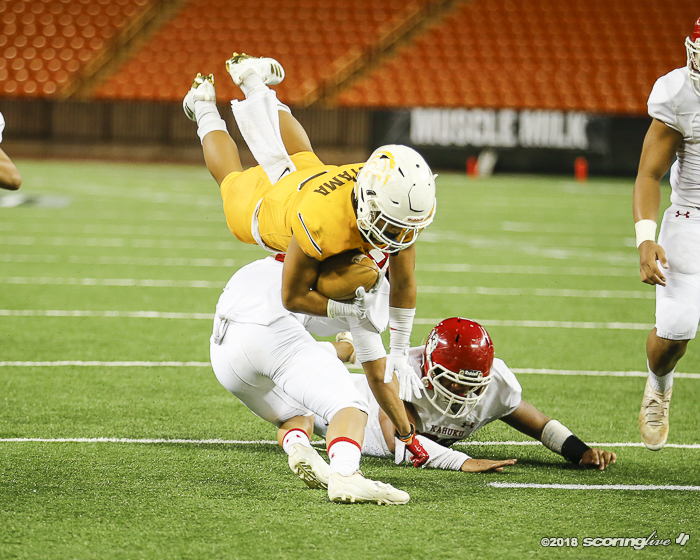 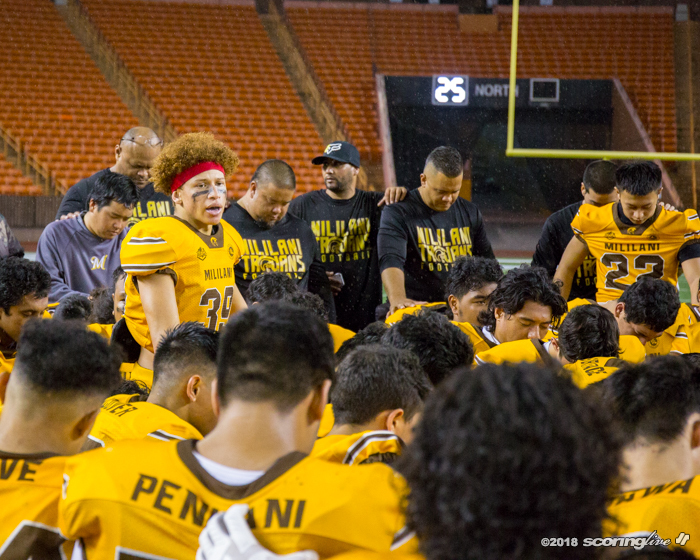 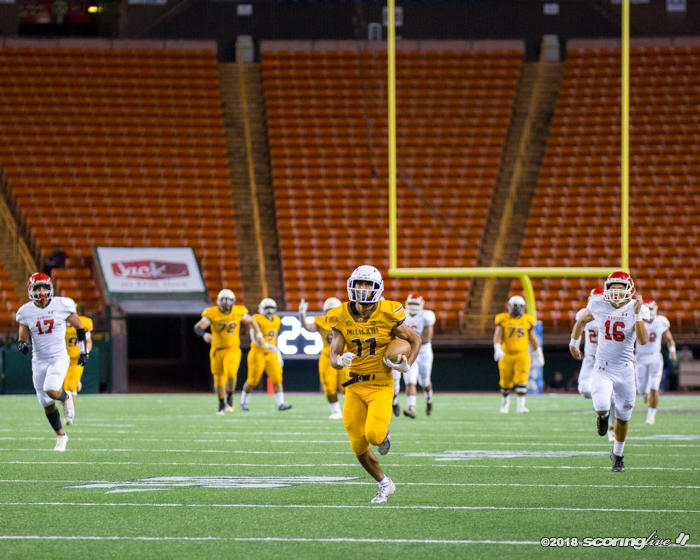 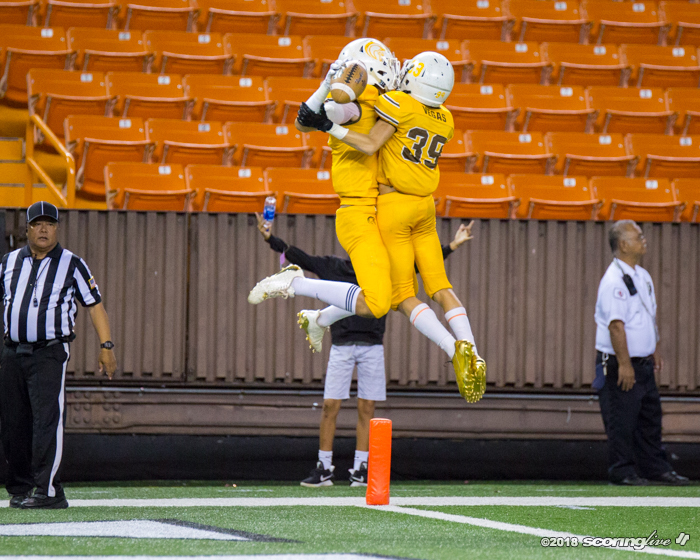 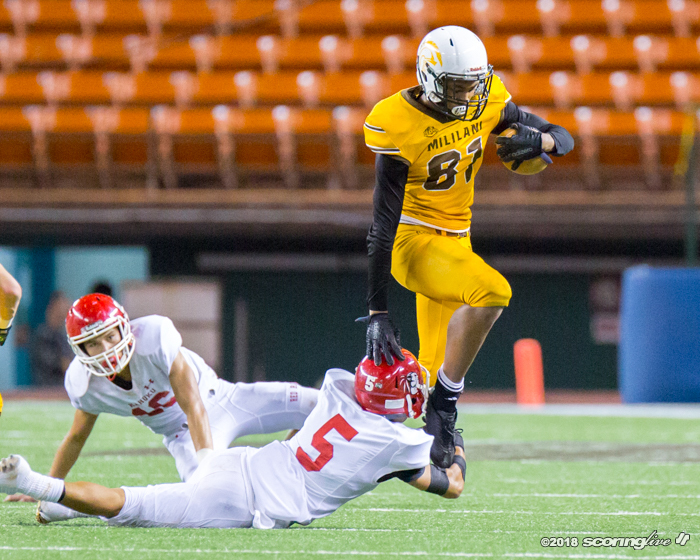 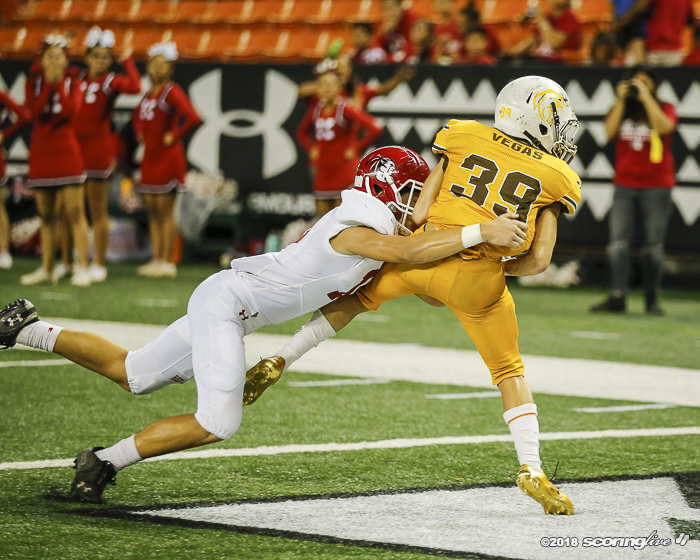 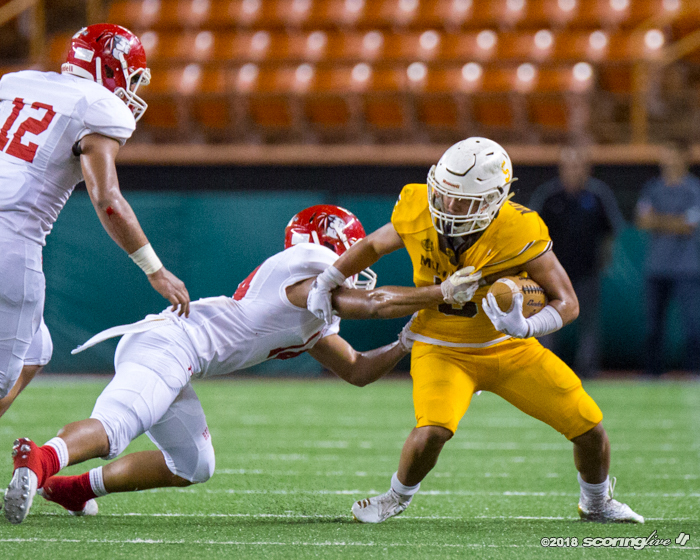 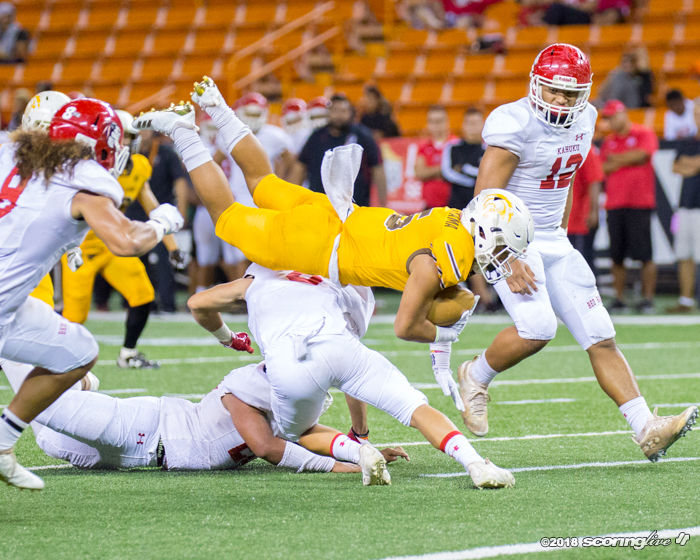 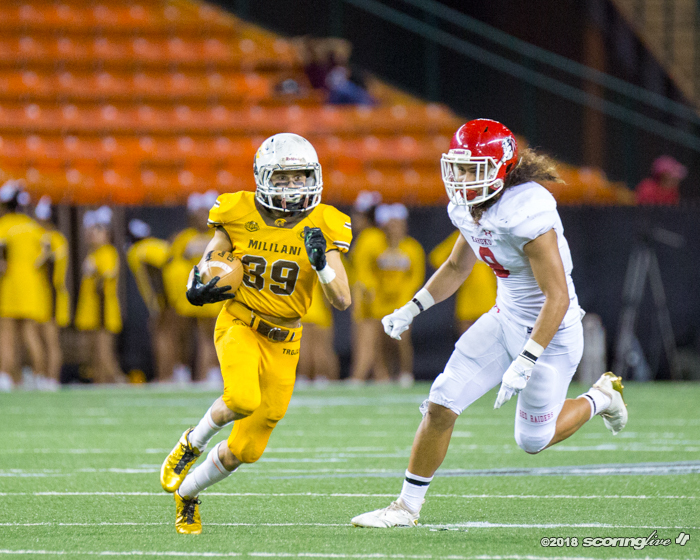 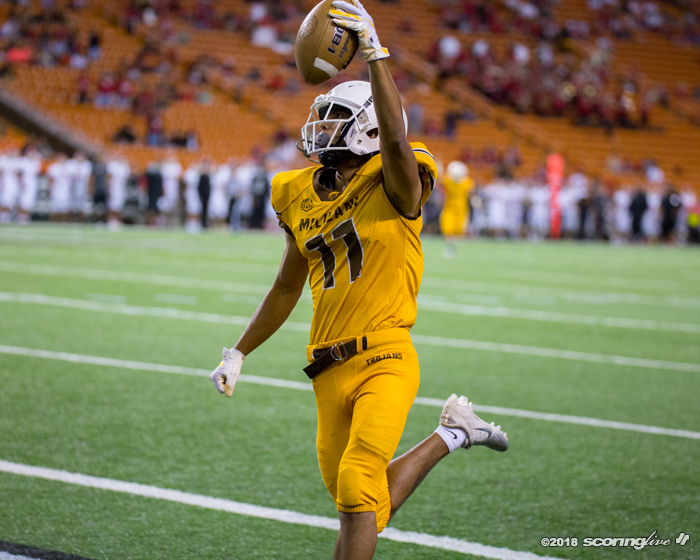 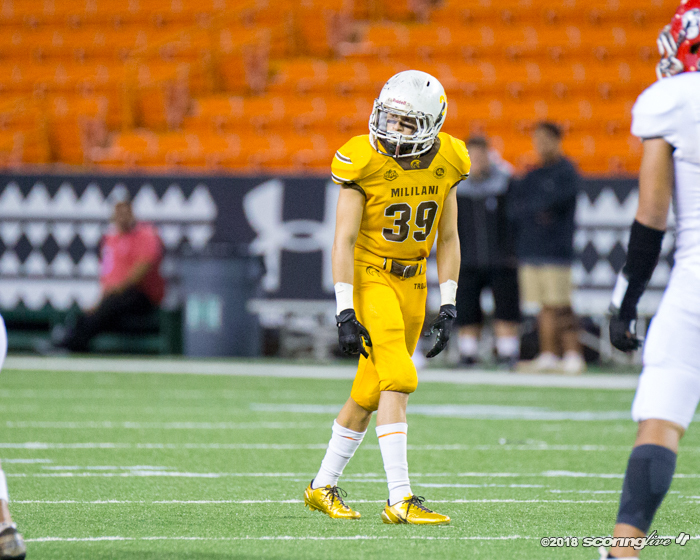 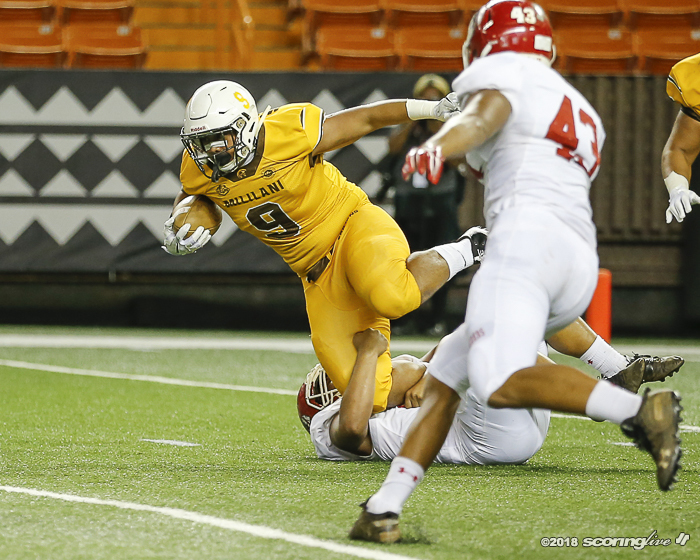 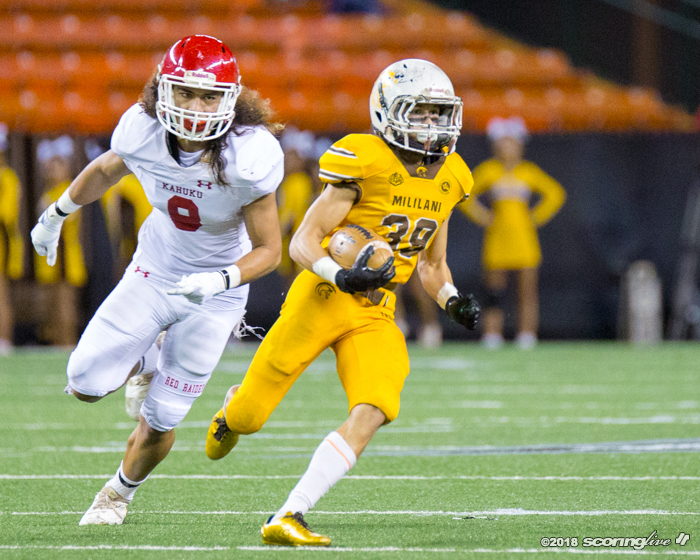 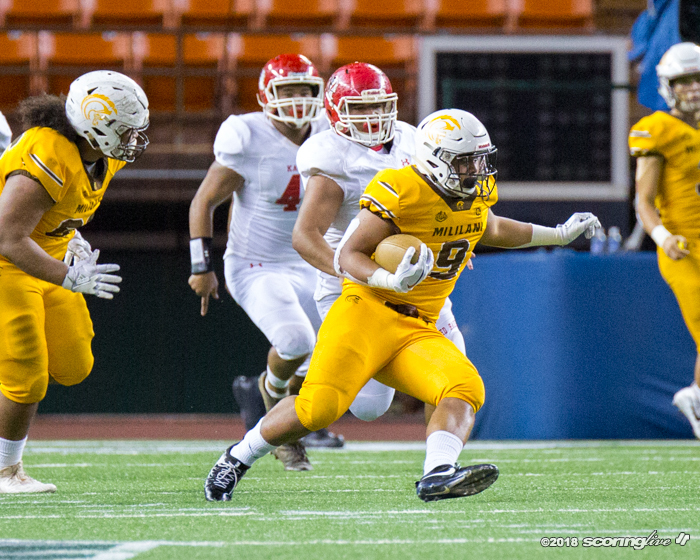 "Basically tonight was (about) who made the big plays and Mililani made four big plays. 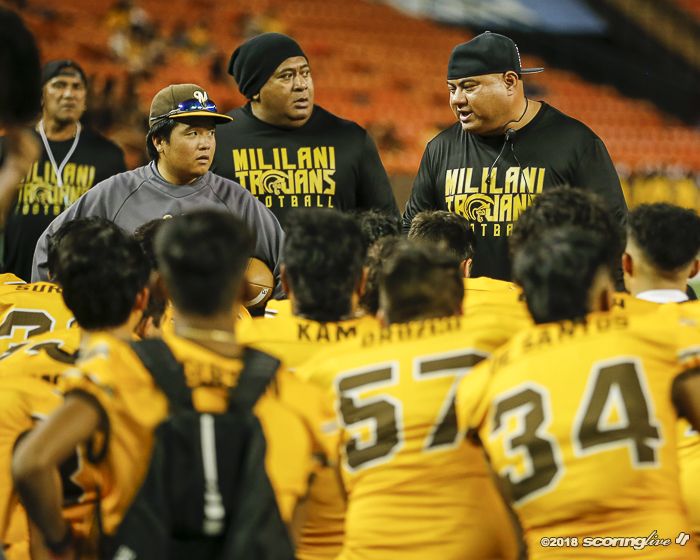 We made one big play, so four to one, they made three better big plays, so that's why we gotta be able to capitalize and be able to sustain drives, especially with our offense — we're a ball-control offense — we gotta be able to sustain drives, keep Mililani off the field and we weren't able to do that tonight." 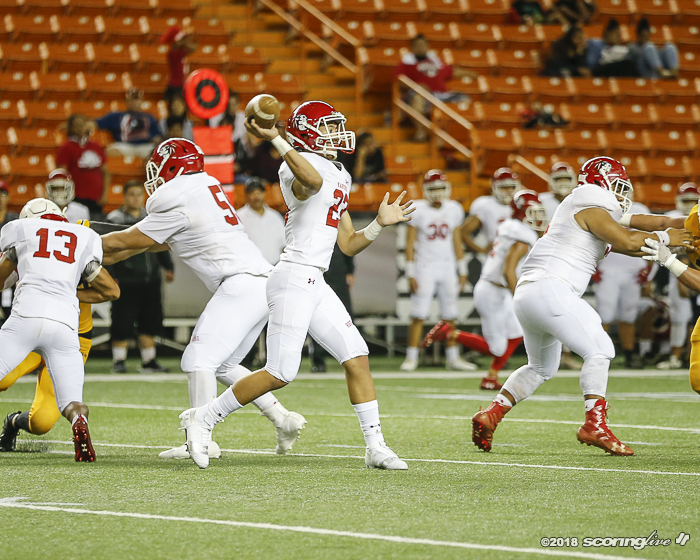 Gabriel, who finished 26-of-39 passing, took accountability of the turnovers. 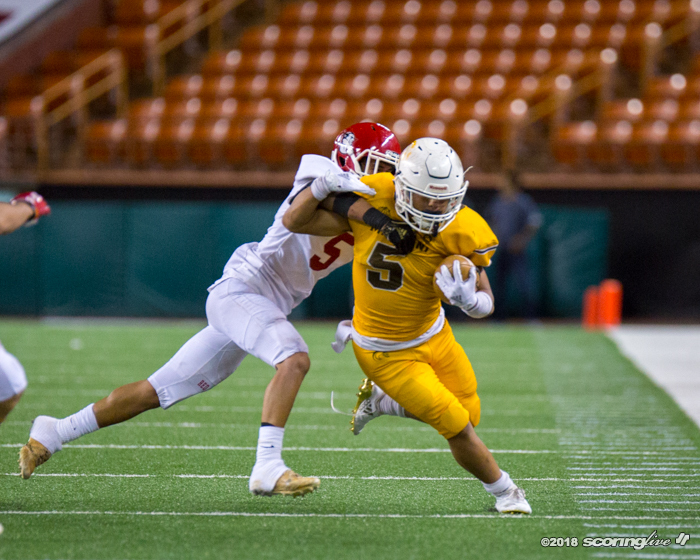 "I just didn't finish. 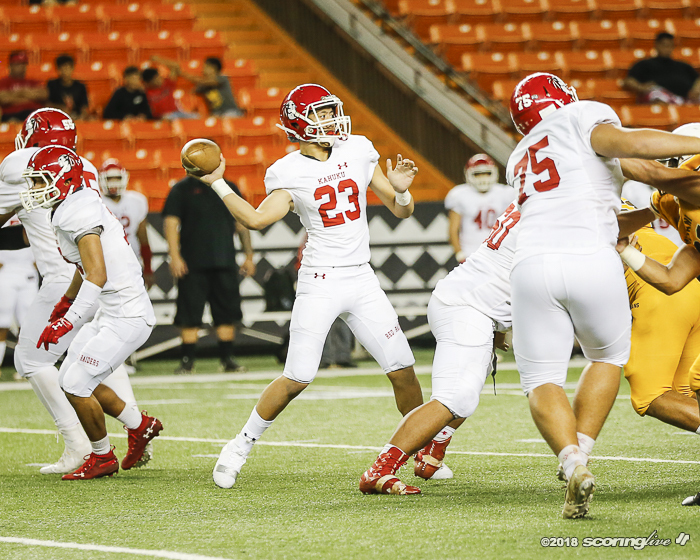 Against Kahuku you need to really put zip on the ball and I didn't so I paid for that, but at the same time, my team got me and they said they believe in me and the whole thing is just forget about it; you can't take back what already happened," said Gabriel, who now has 37 TD passes against eight interceptions this season. 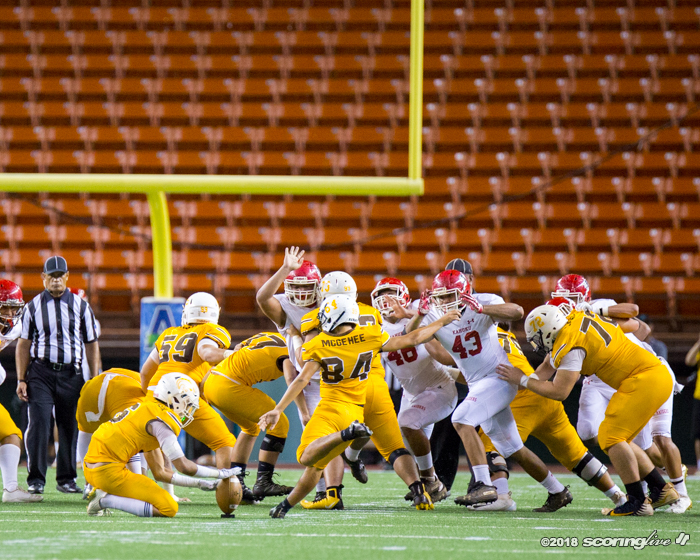 Liam McGehee tacked on the extra point to give the Trojans a 14-7 lead with 4:22 left in the second quarter. 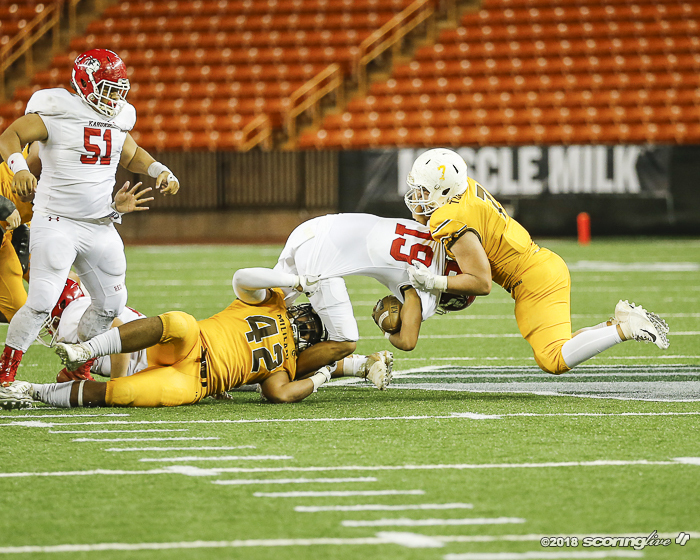 Kahuku then went three-and-out — including a key Kady sack on third down — it punted away and Mililani took over at midfield. 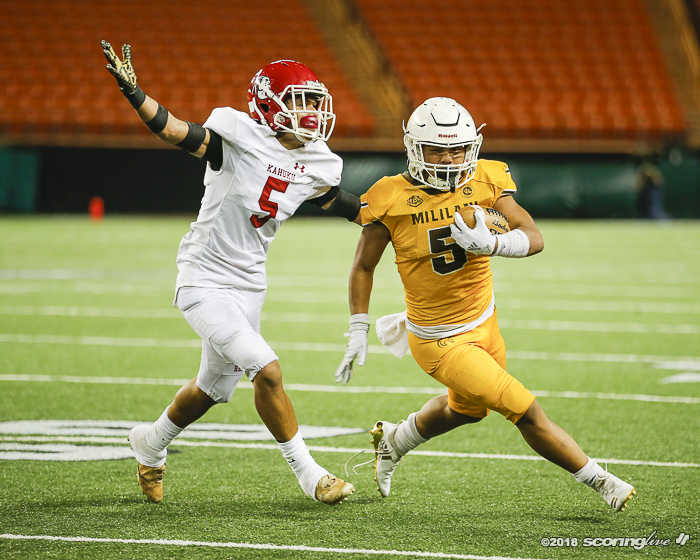 Two plays into the drive, Gabriel hit Reichel Vegas in the right seam for a 29-yard pitch-and-catch to set-up Kilifi Malepeai's 11-yard TD run two plays later. 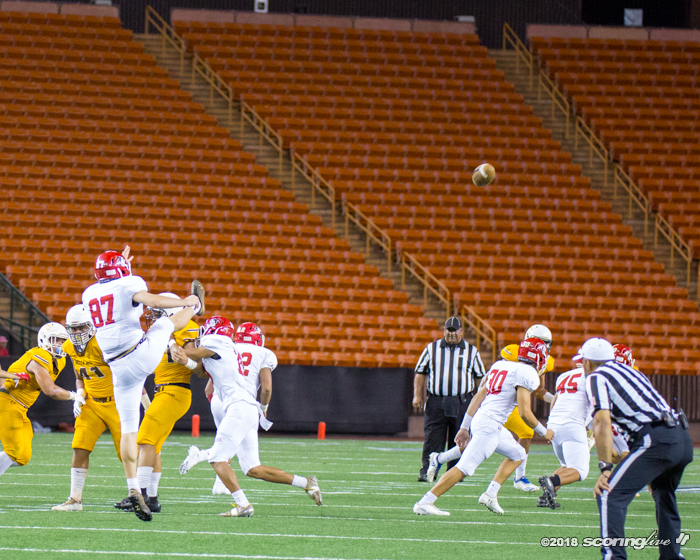 After the McGehee PAT, the lead stretched to 21-7 with 1:03 remaining in the first half. 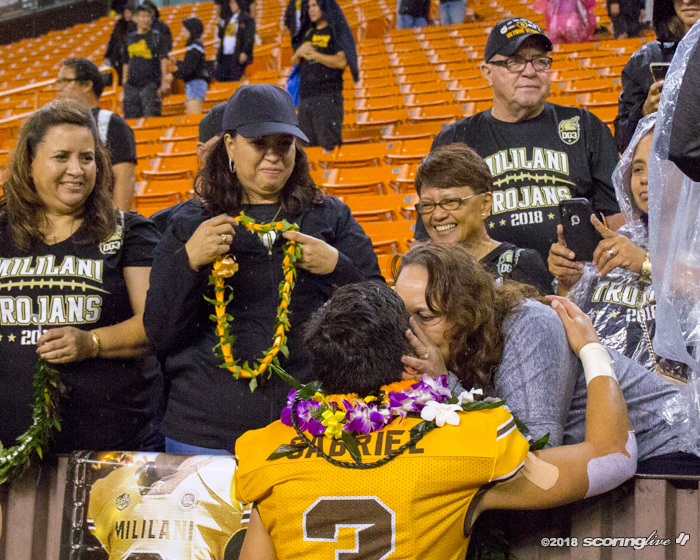 The Trojans closed out the scoring with Gabriel's 47-yard TD pass to Vegas with 3:41 left in the third quarter, but the extra point was blocked. 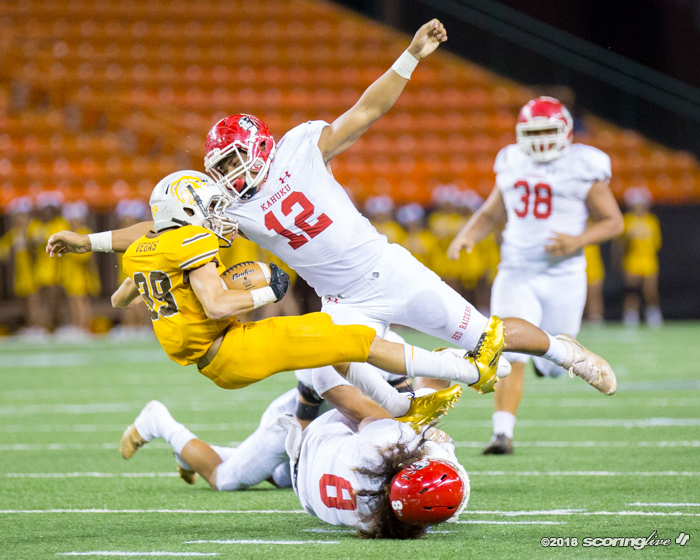 While the Kahuku quarterbacks were under duress much of the night, Gabriel was sacked just once. 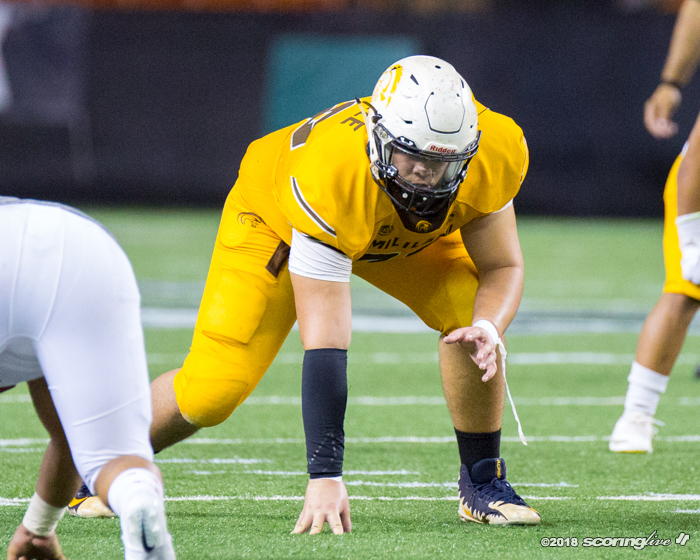 "I think the o-line held it down pretty dang well. 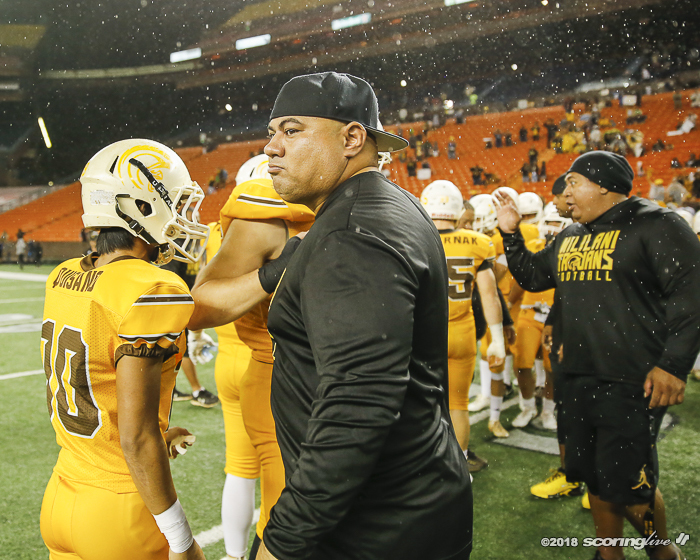 The game plan is if the o-line gives me time, some good things can happen and the o-line did that and luckily we came out with the win," Gabriel said. 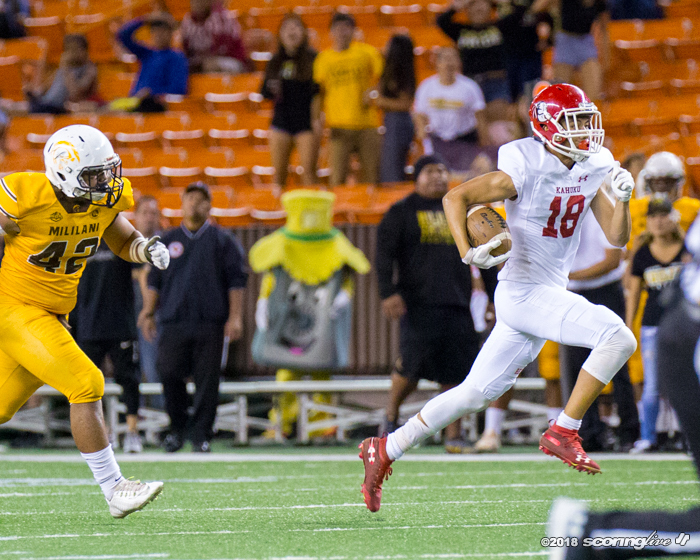 Carvalho spoke in the lead-up to the game about wanting to bring pressure against Gabriel. 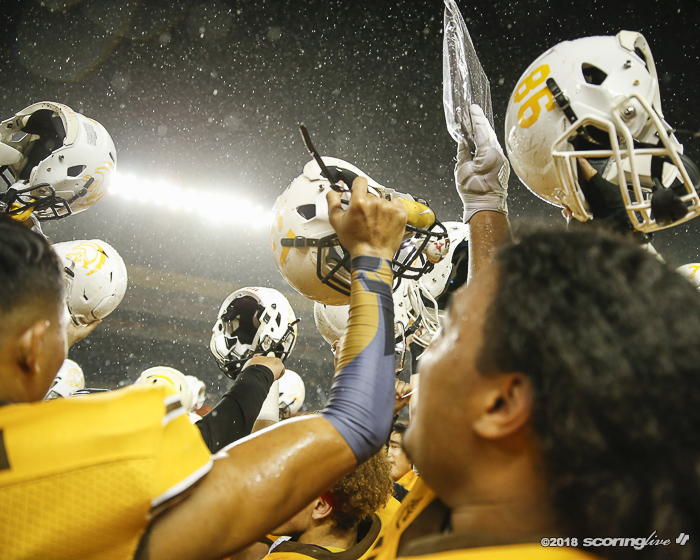 "We did. 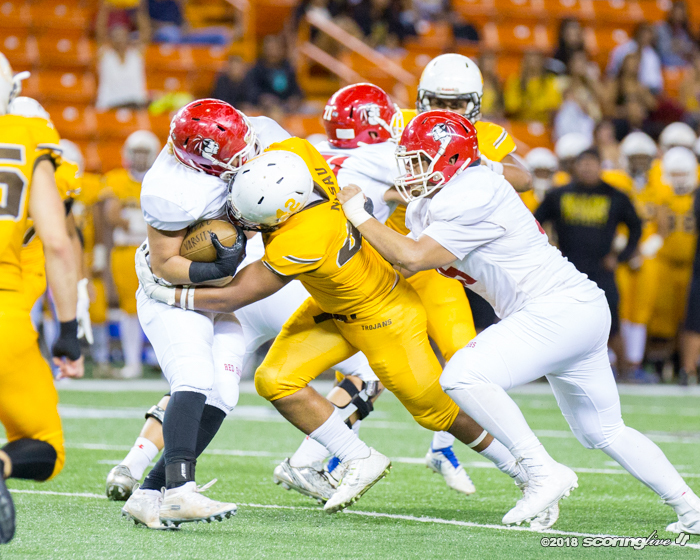 We brought pressure on Gabriel, but like I said, we blew coverages and he just hurt us with the big plays and that's what happened tonight. 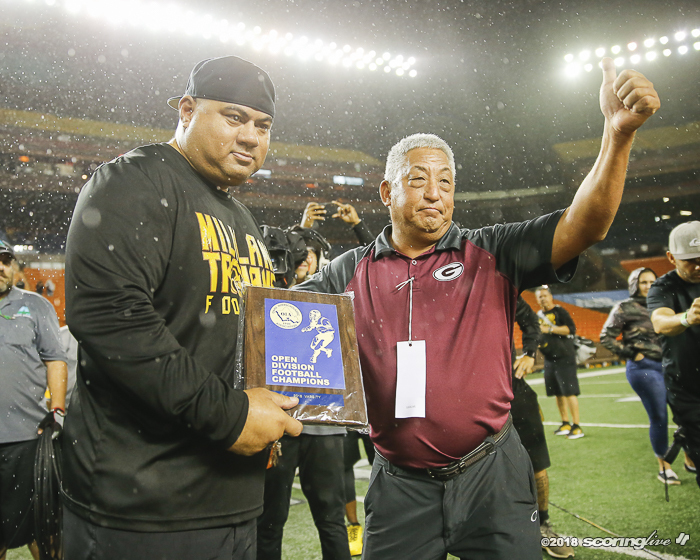 The big plays, they capitalized on it," Carvalho said. 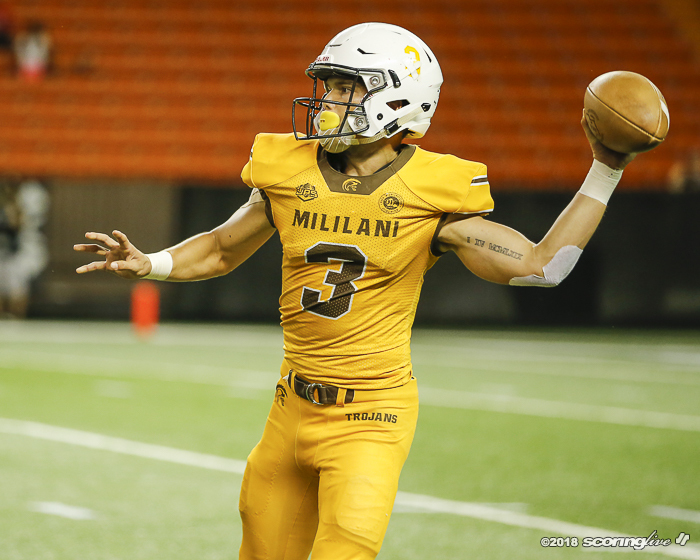 Sauvao finished 9-of-20 passing for 126 yards and Paulo posted four grabs for 88 yards. 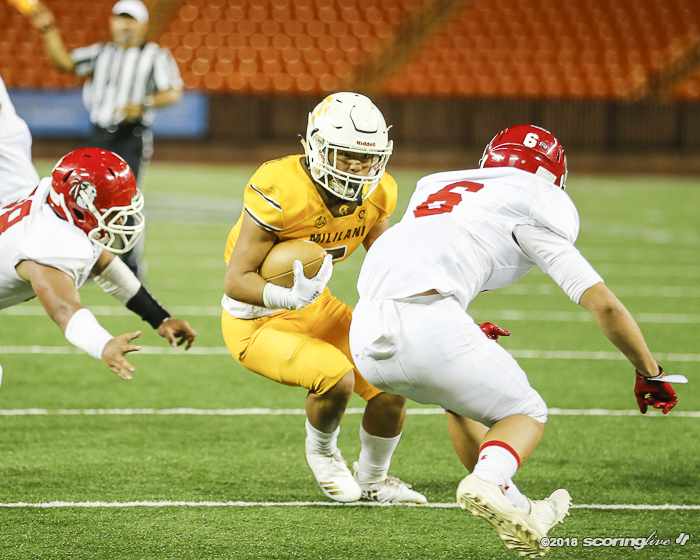 Mililani handed Kahuku a 38-10 loss at Carleton E. Weimer Field in the regular season on Sept. 29. 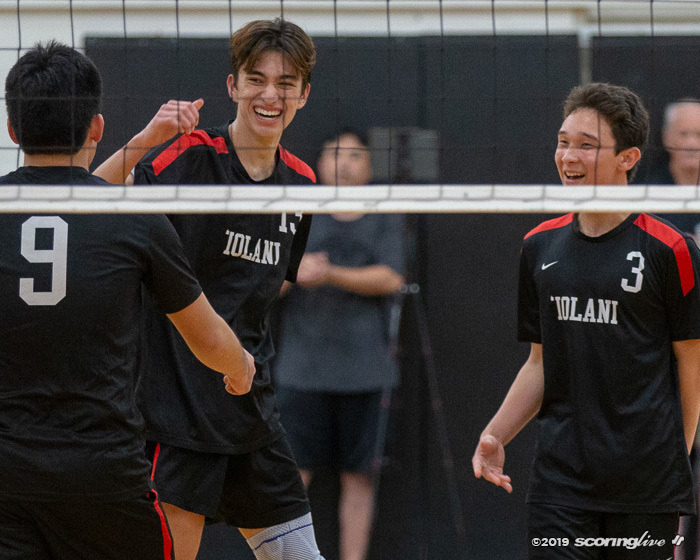 The Red Raiders were seeking their fourth straight league title and record 27th overall. 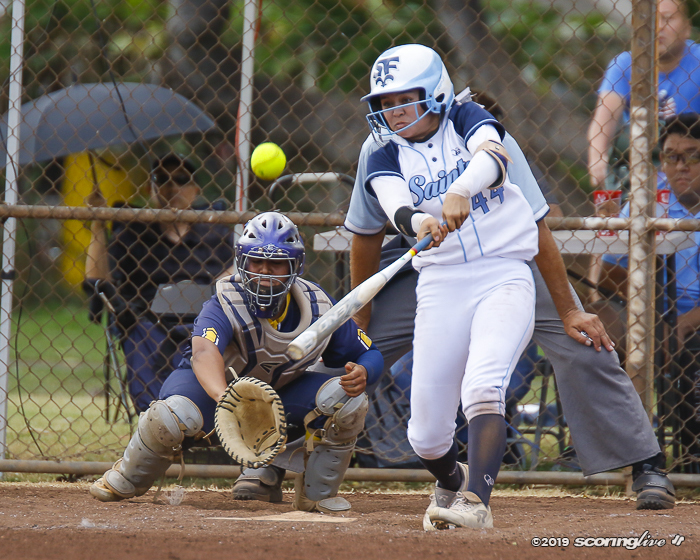 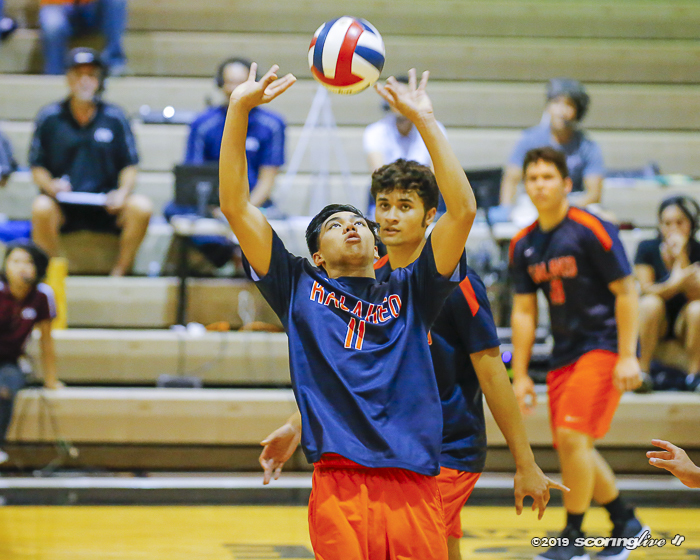 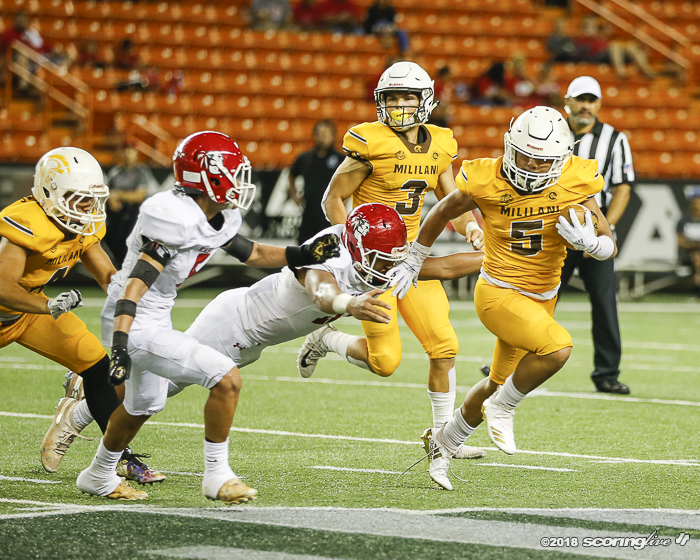 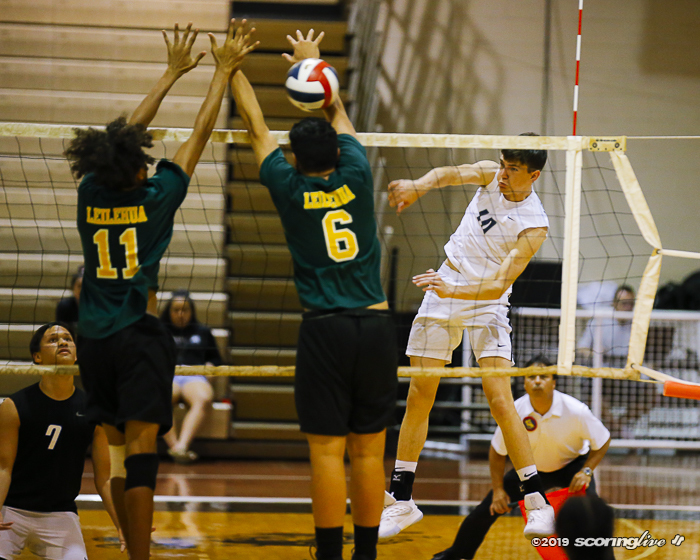 Both teams are in this month's First Hawaiian Bank State Championships, with the semifinal round set for Friday, Nov. 16 at Aloha Stadium. 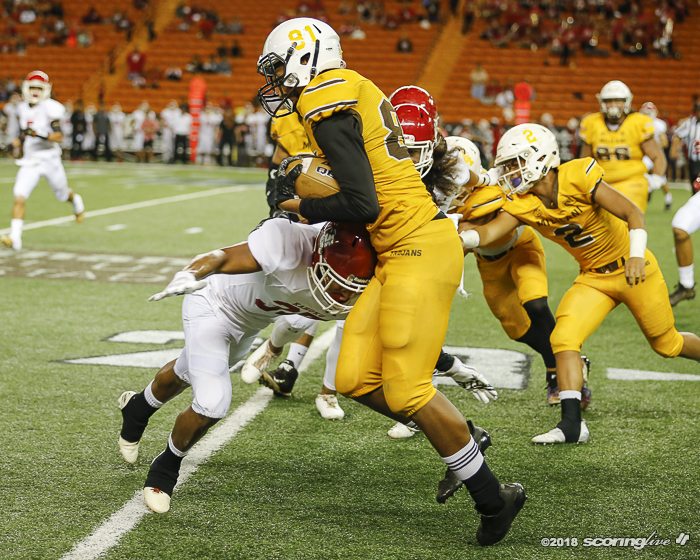 Mililani will play OIA third-place finisher Campbell at 4:30 p.m. and Kahuku will face Saint Louis at 7:30 p.m.